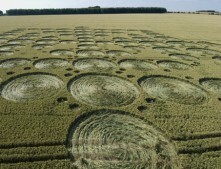 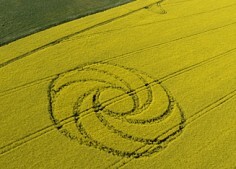 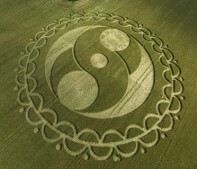 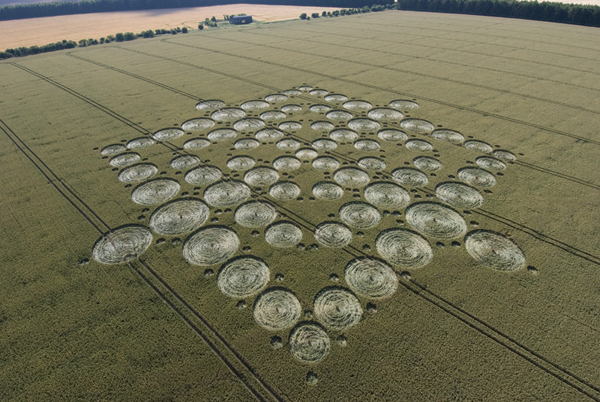 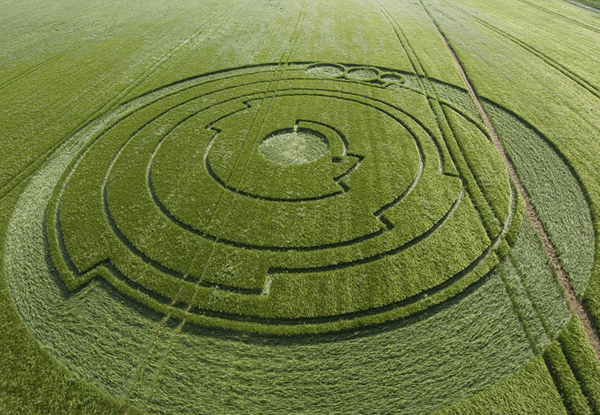 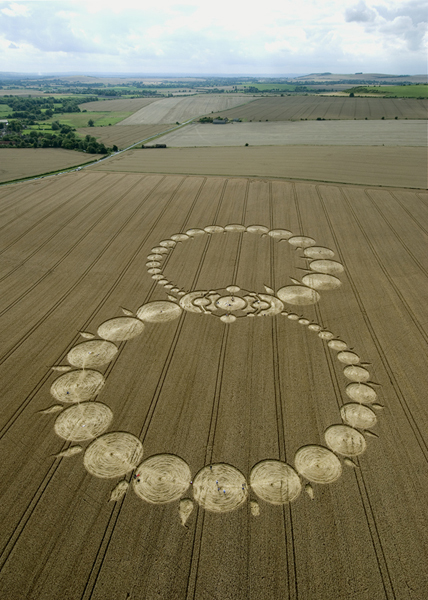 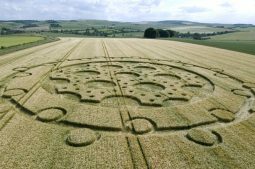 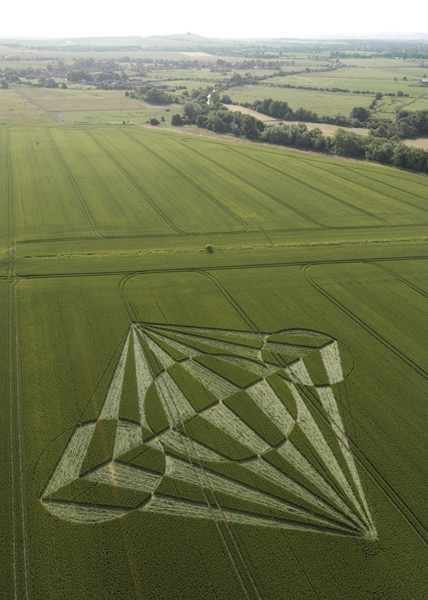 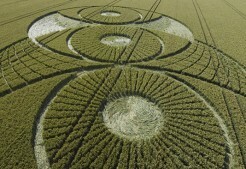 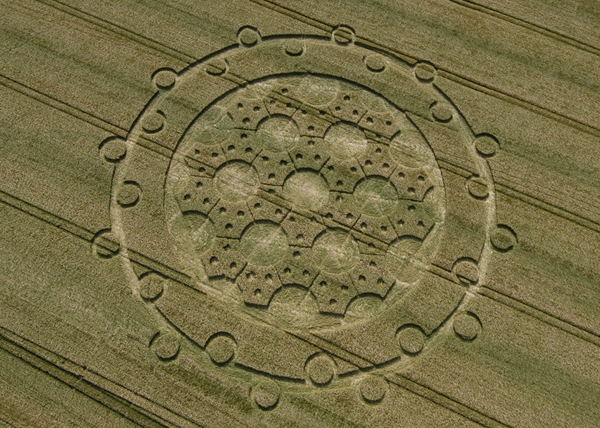 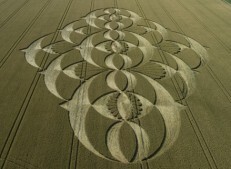 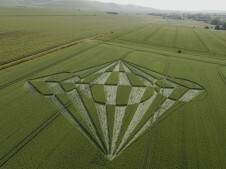 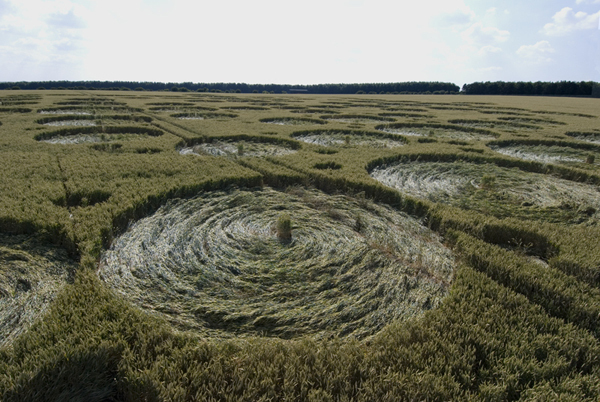 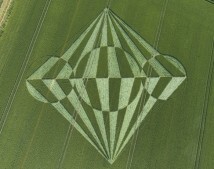 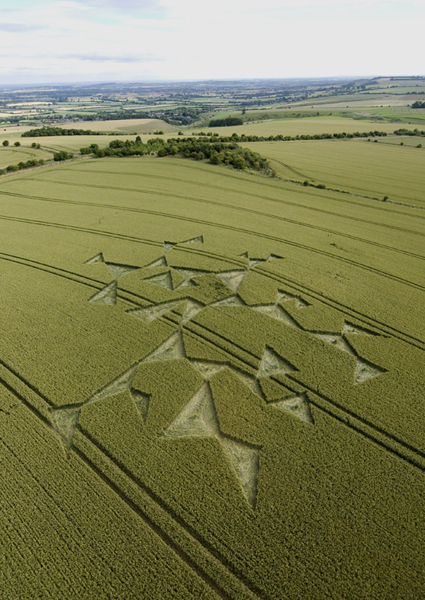 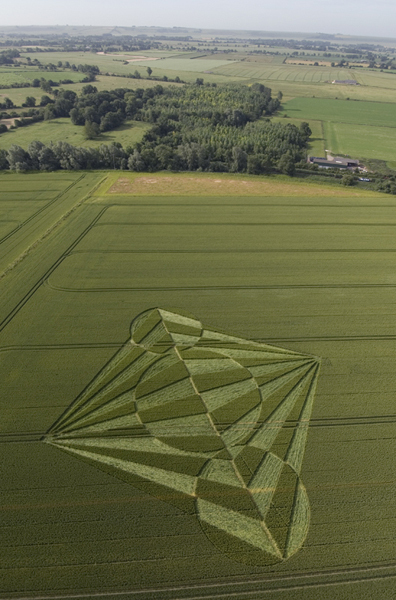 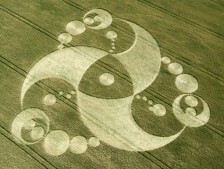 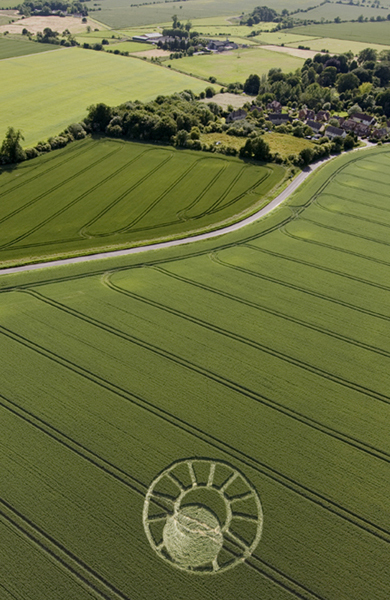 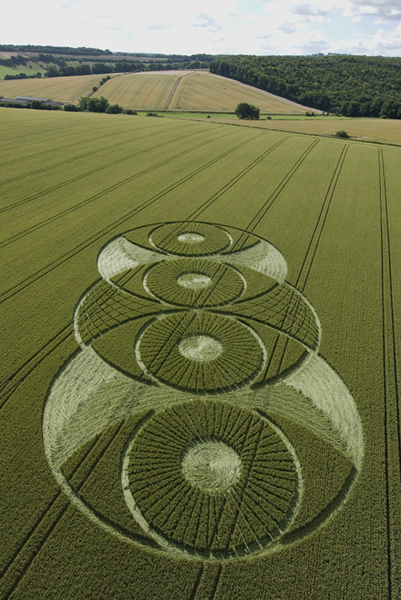 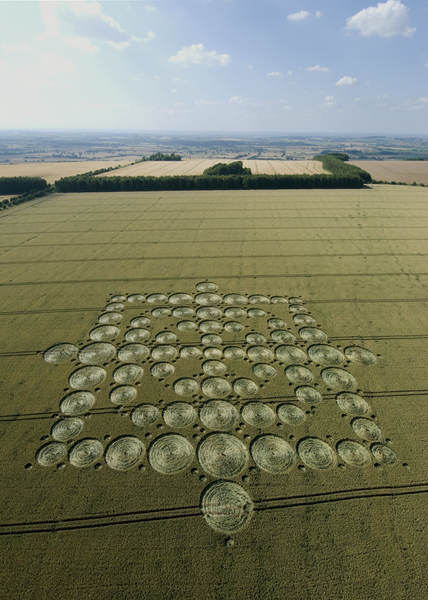 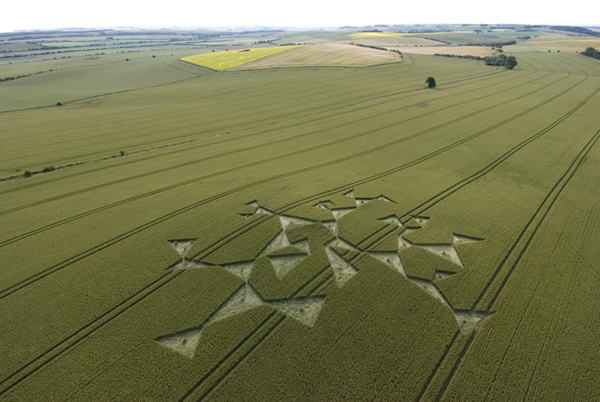 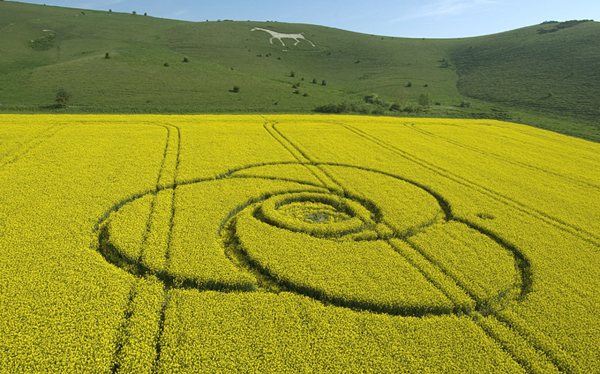 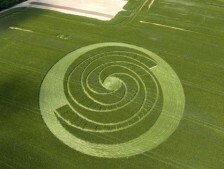 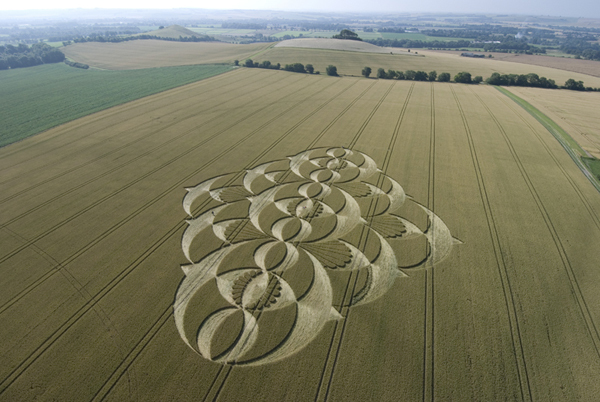 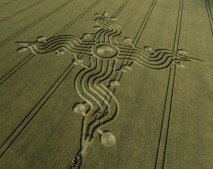 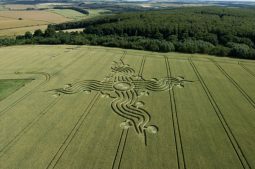 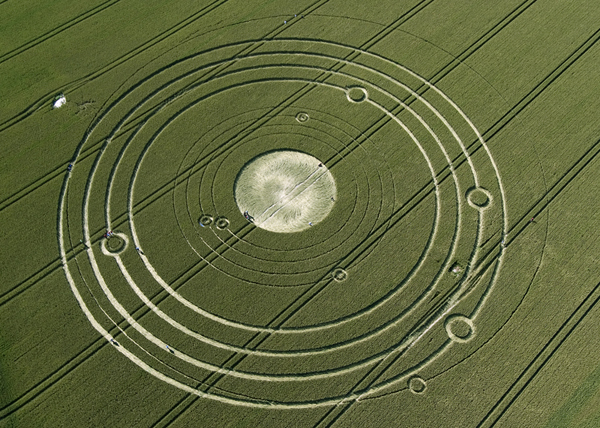 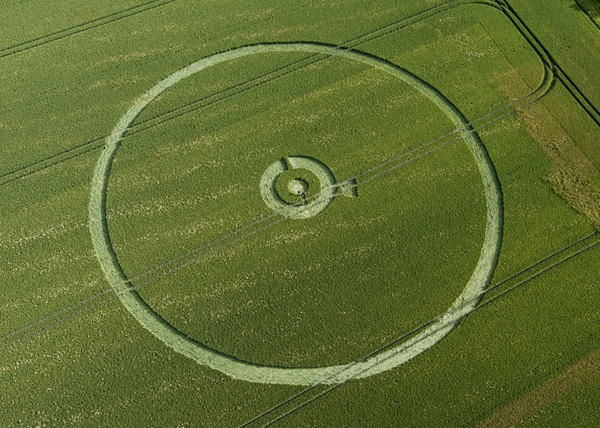 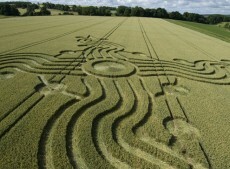 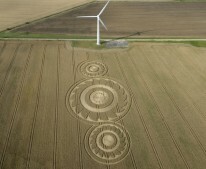 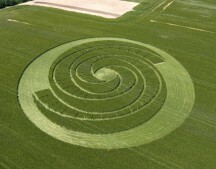 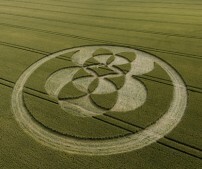 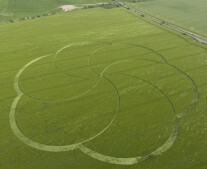 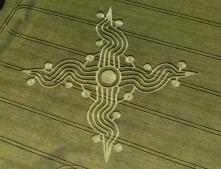 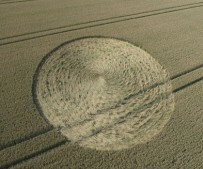 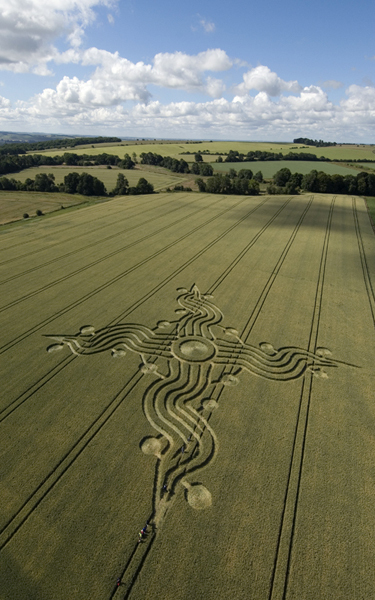 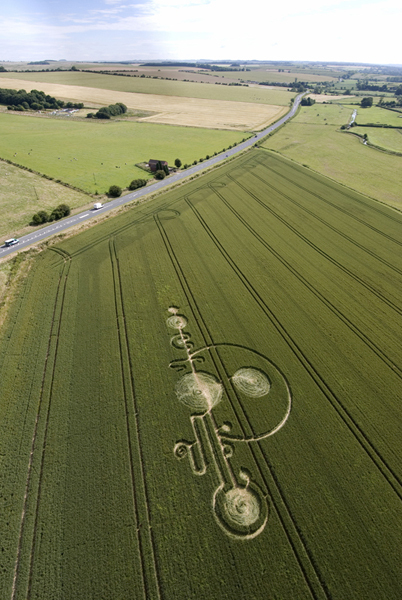 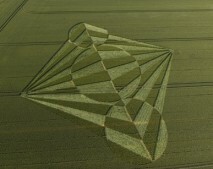 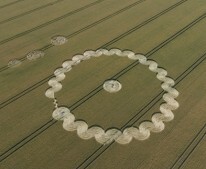 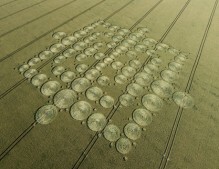 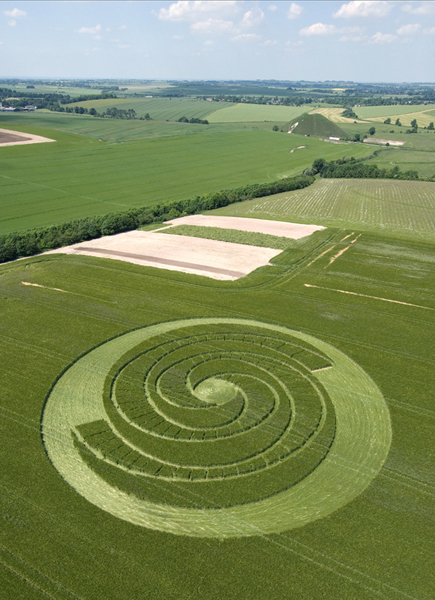 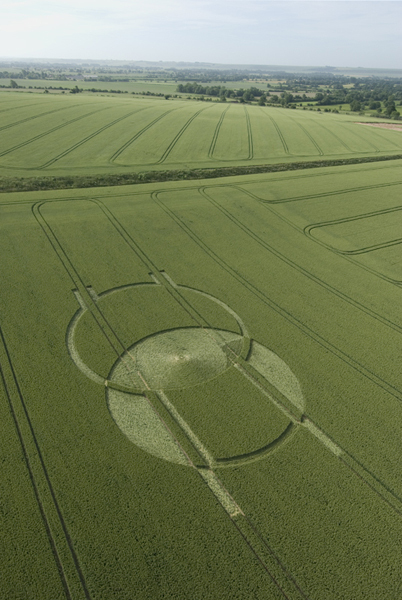 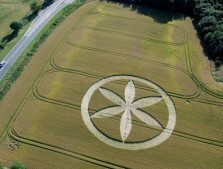 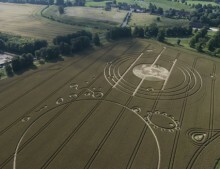 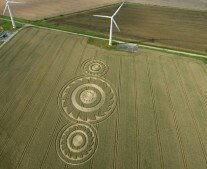 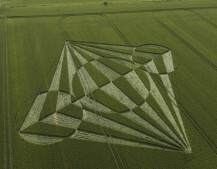 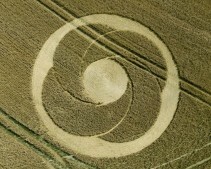 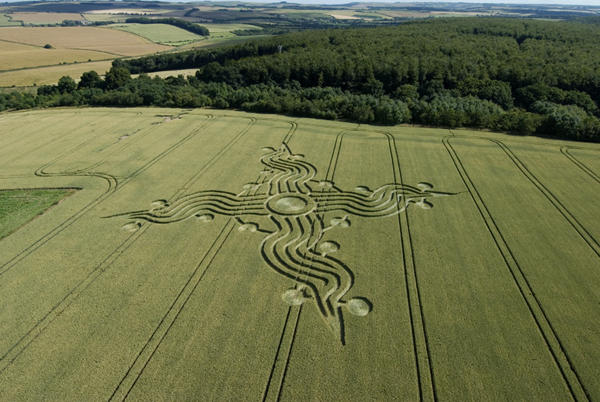 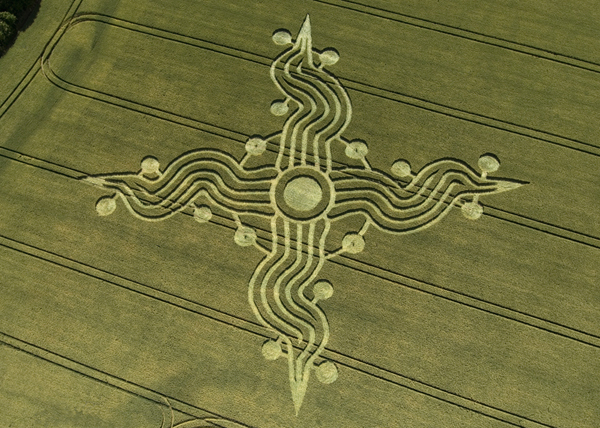 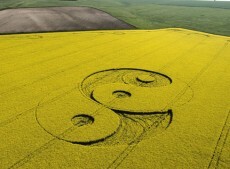 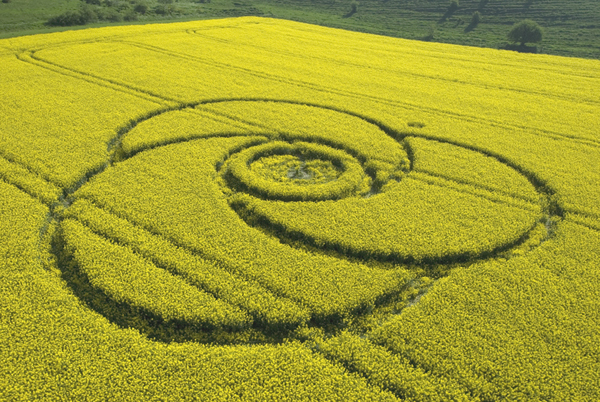 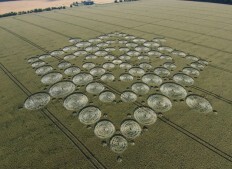 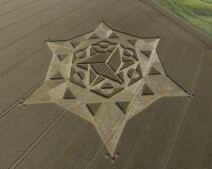 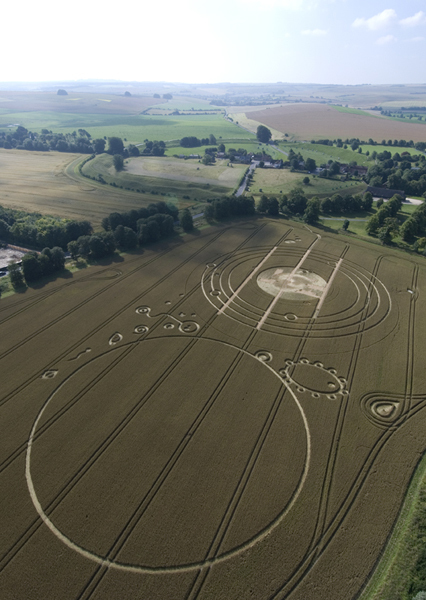 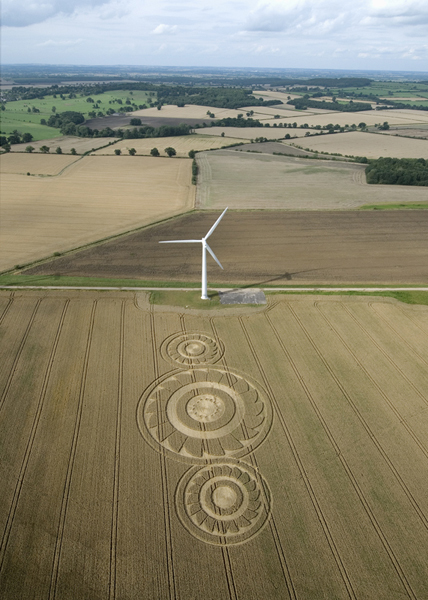 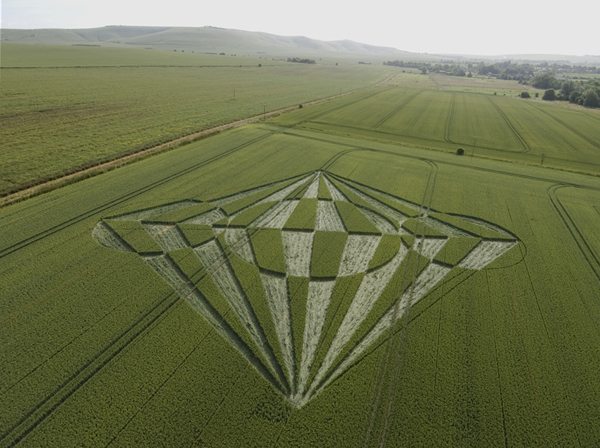 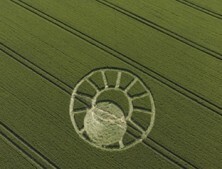 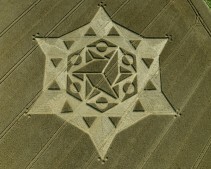 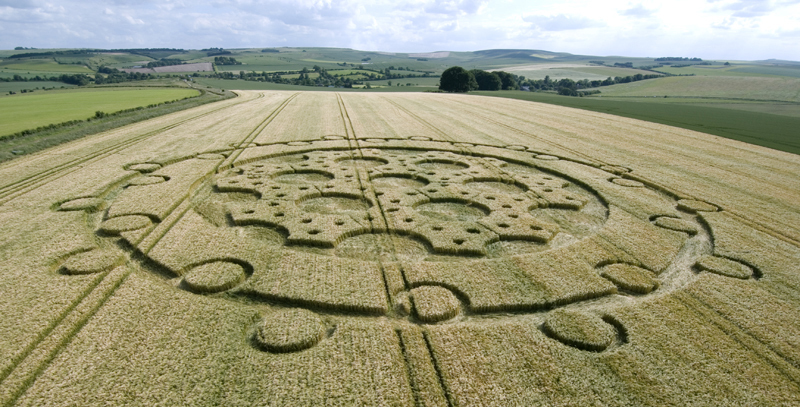 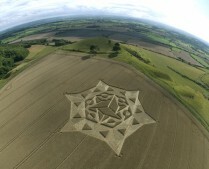 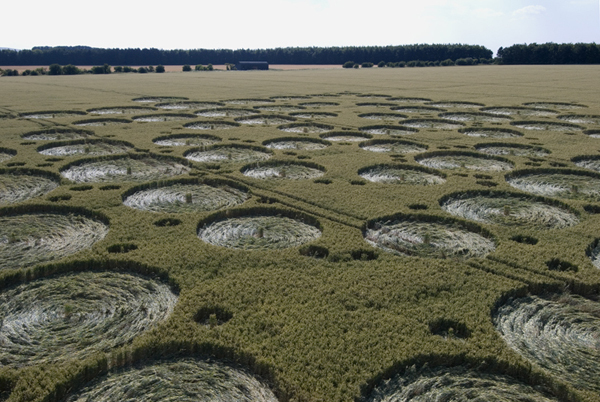 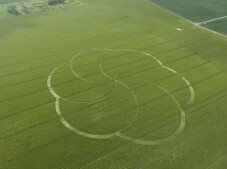 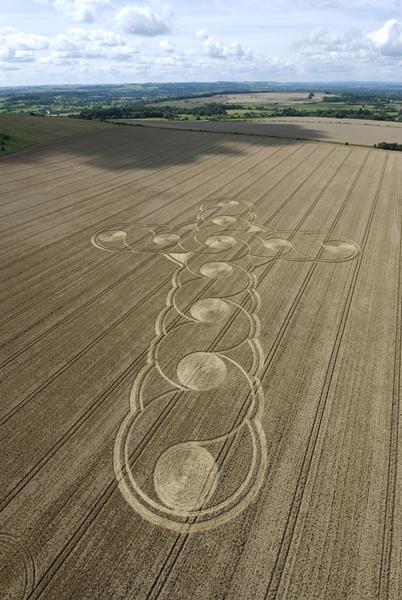 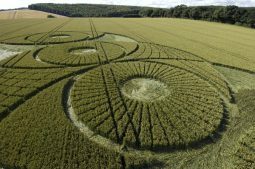 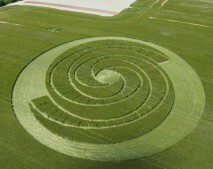 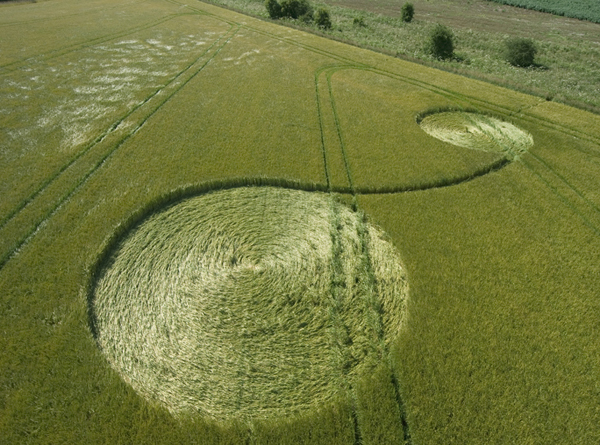 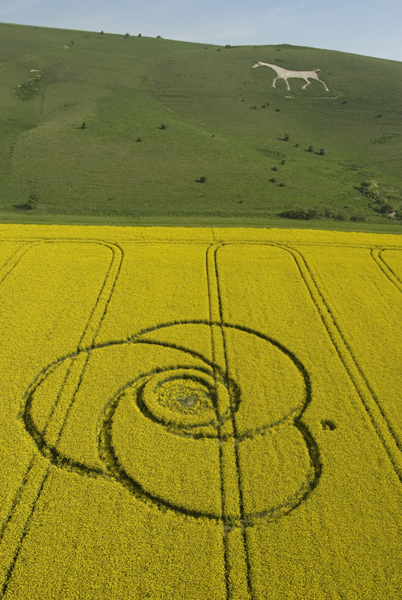 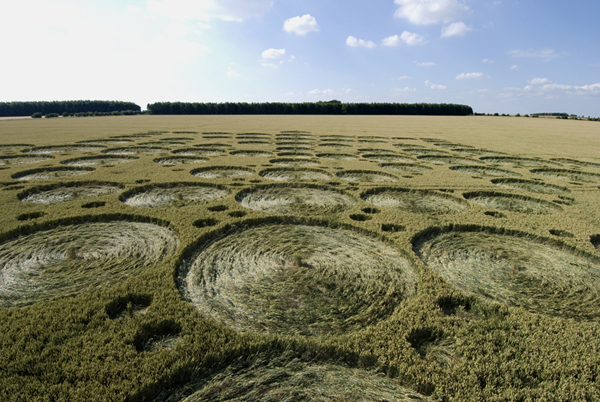 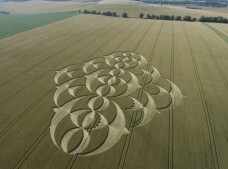 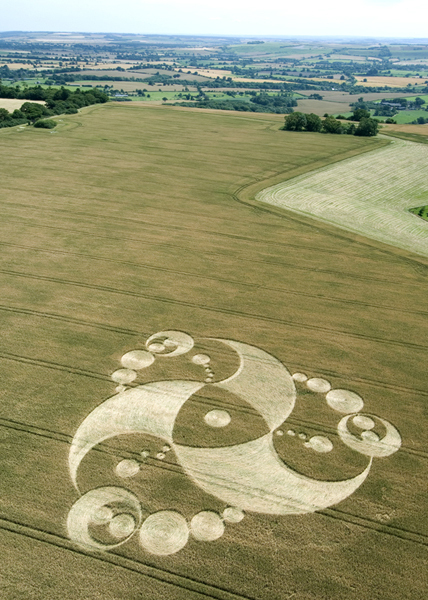 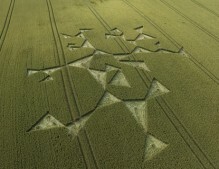 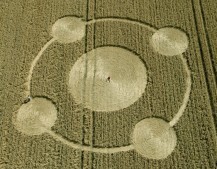 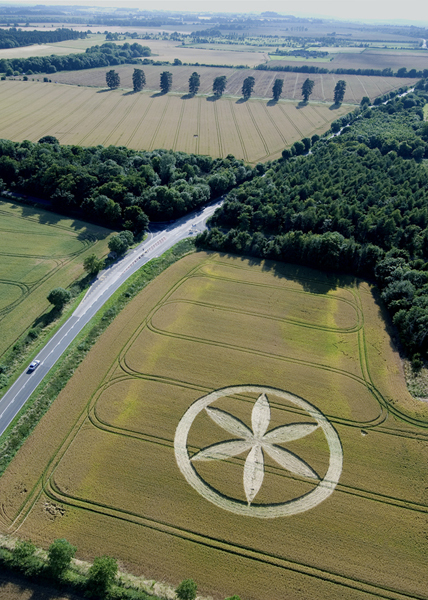 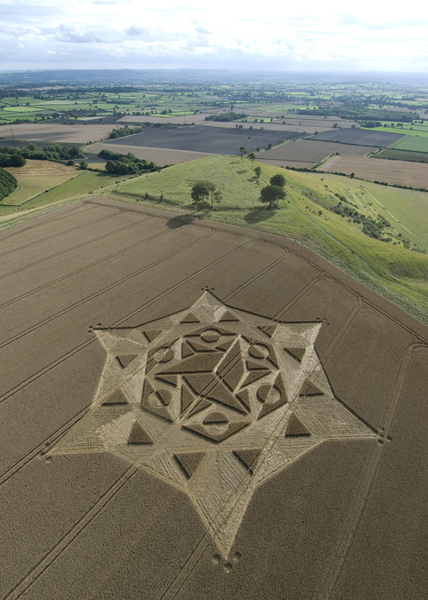 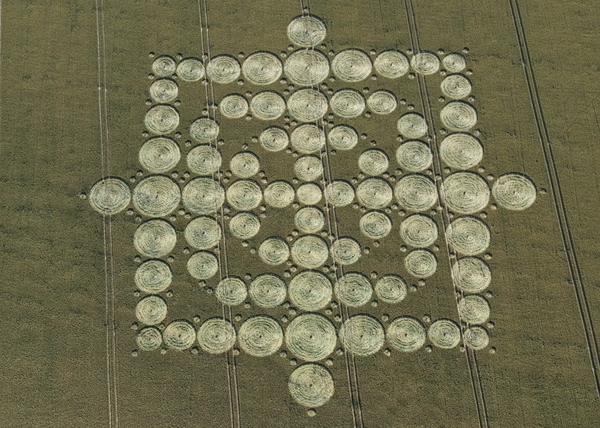 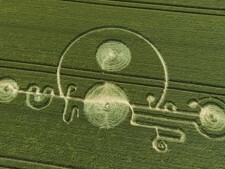 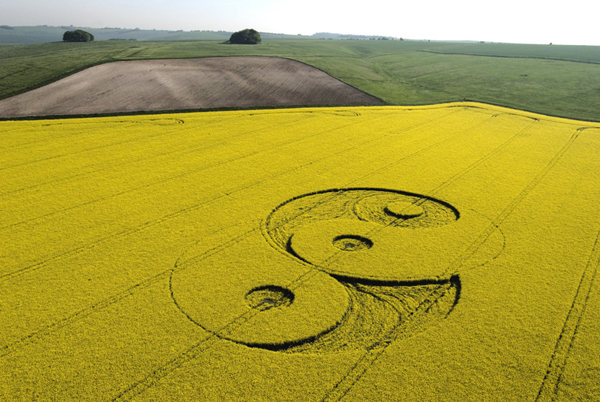 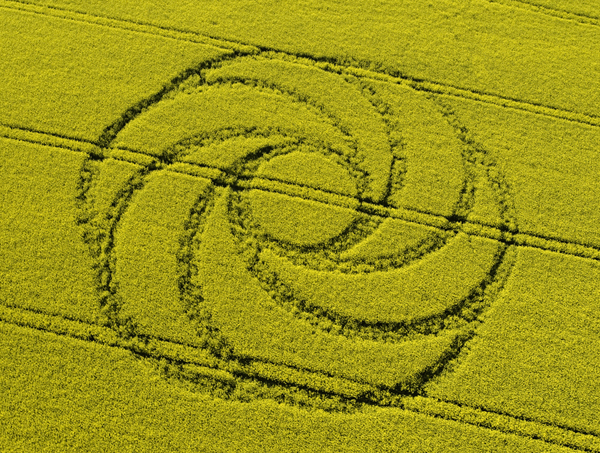 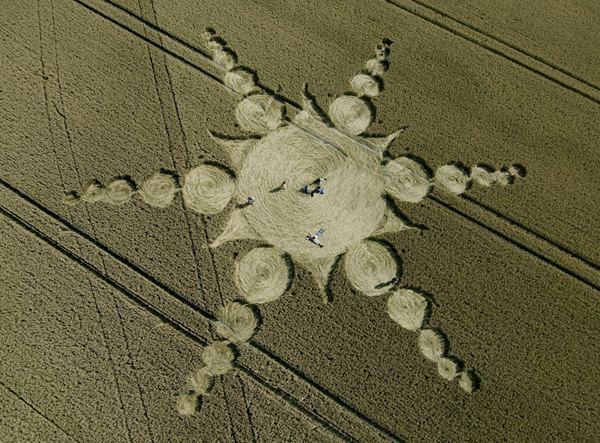 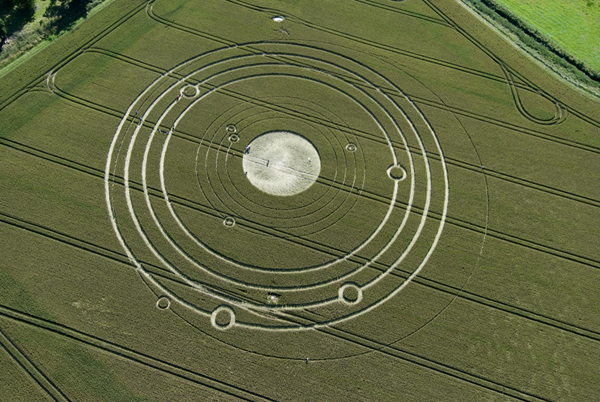 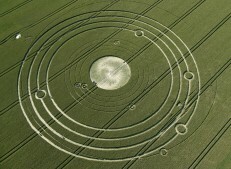 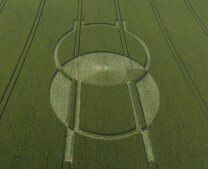 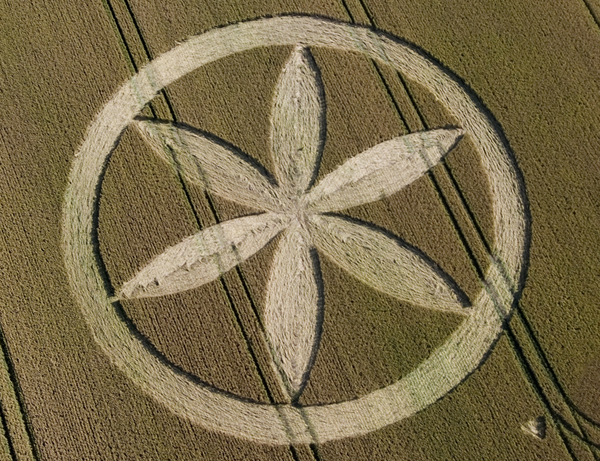 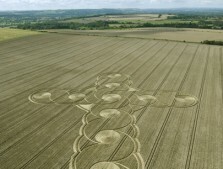 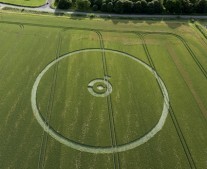 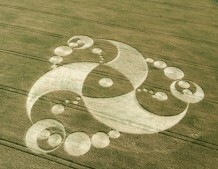 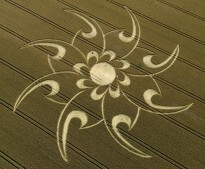 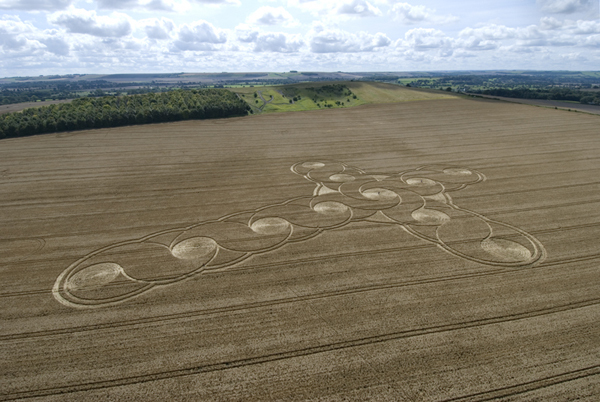 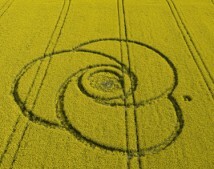 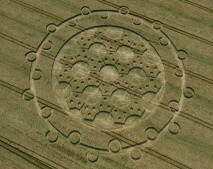 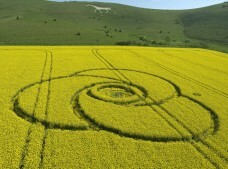 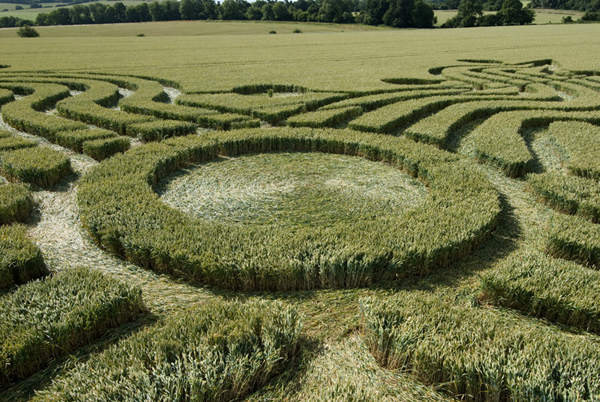 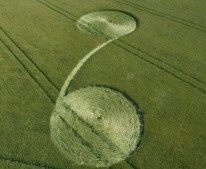 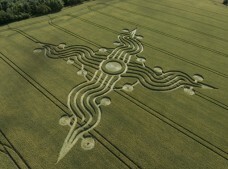 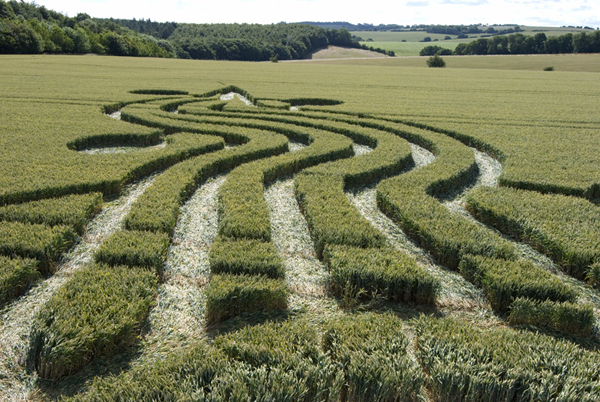 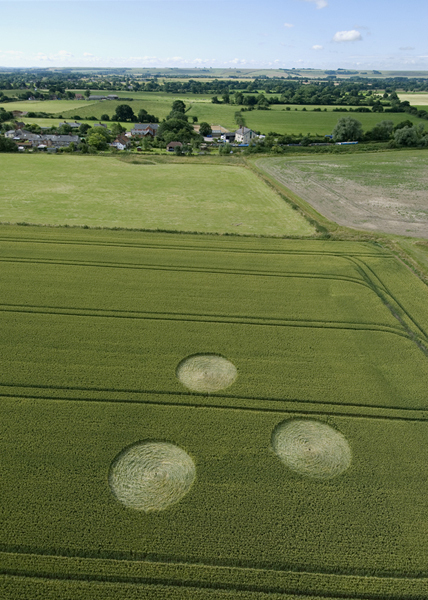 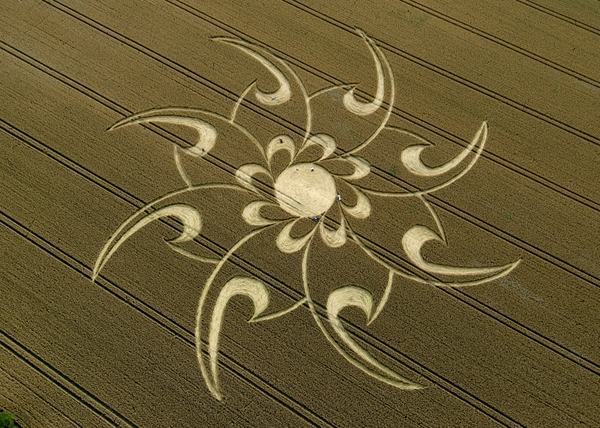 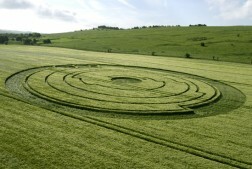 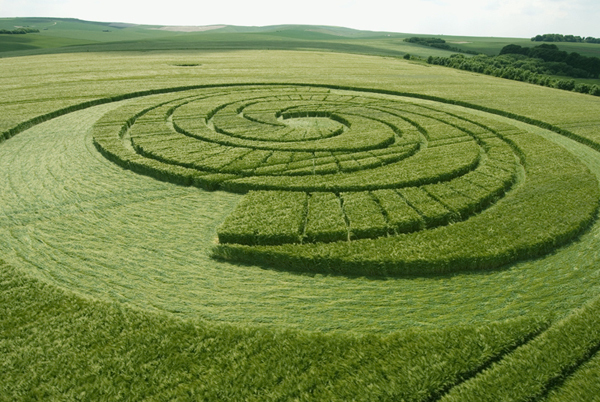 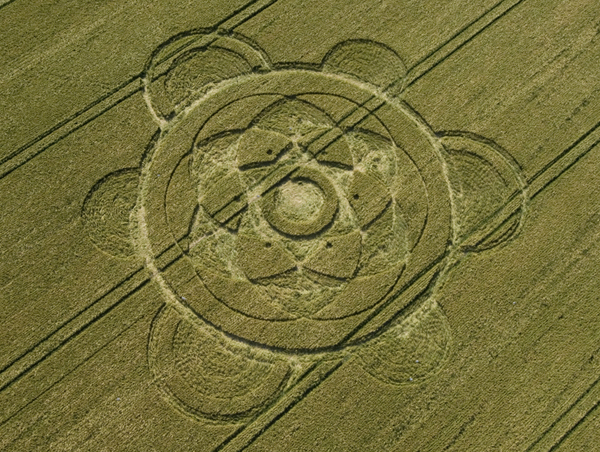 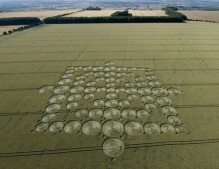 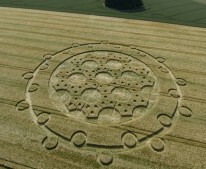 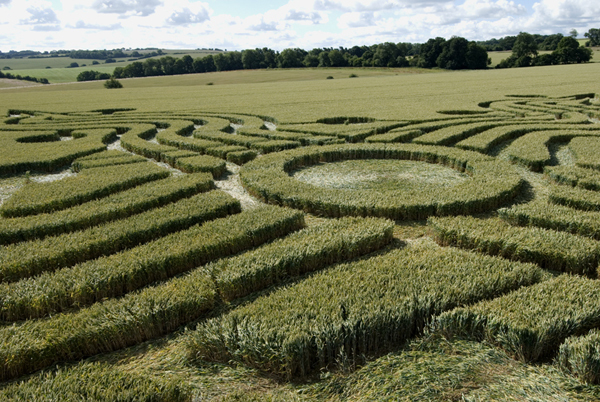 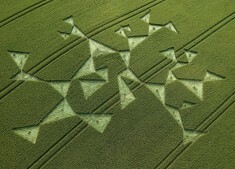 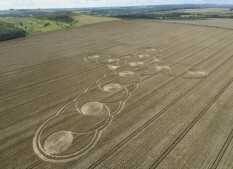 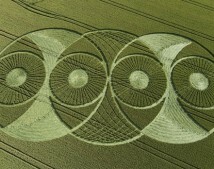 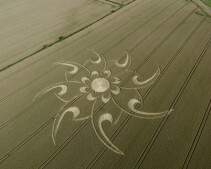 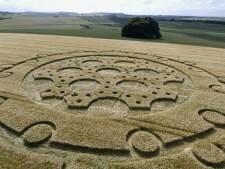 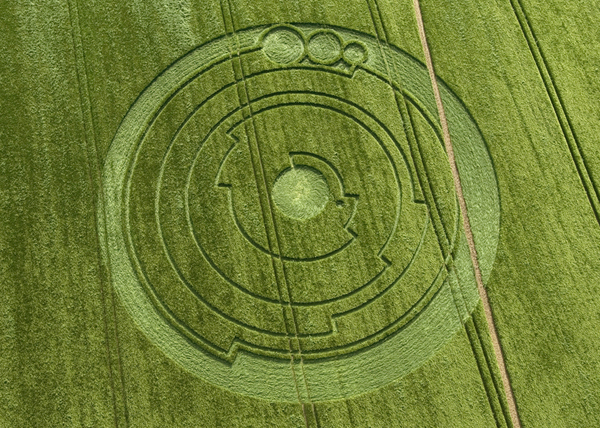 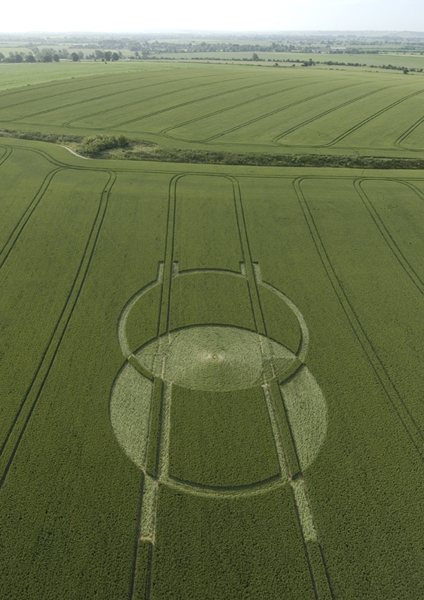 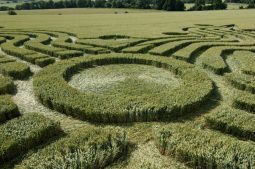 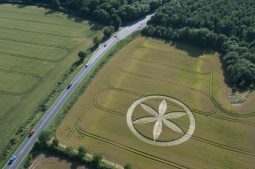 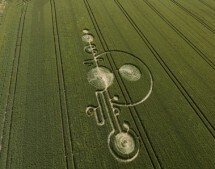 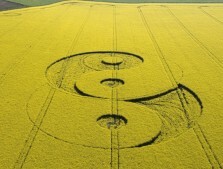 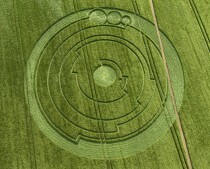 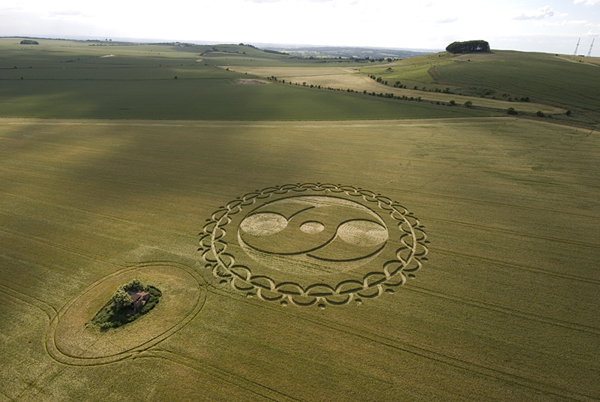 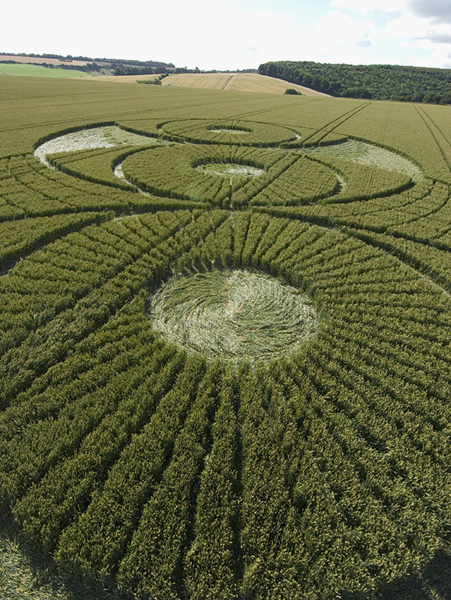 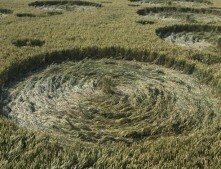 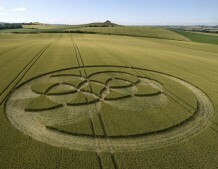 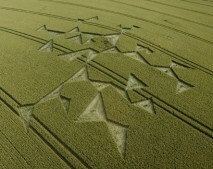 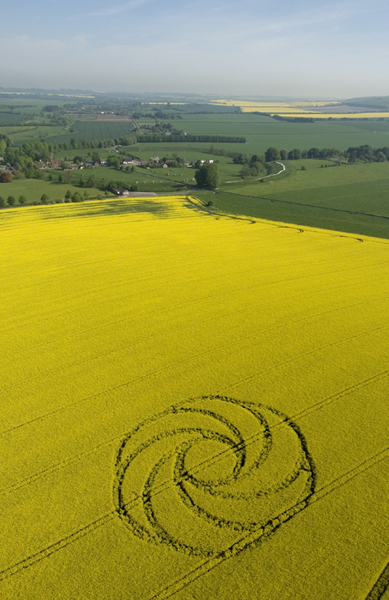 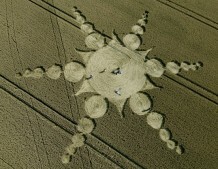 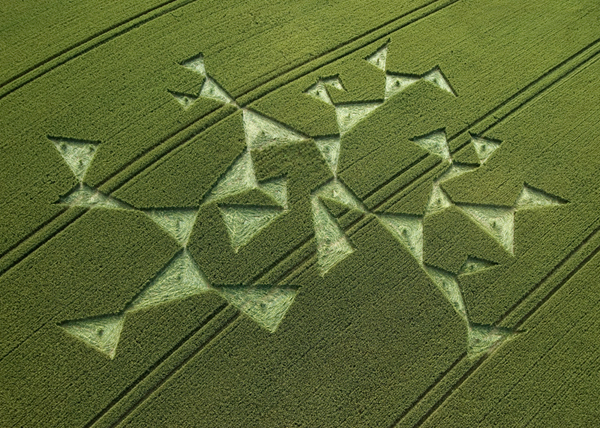 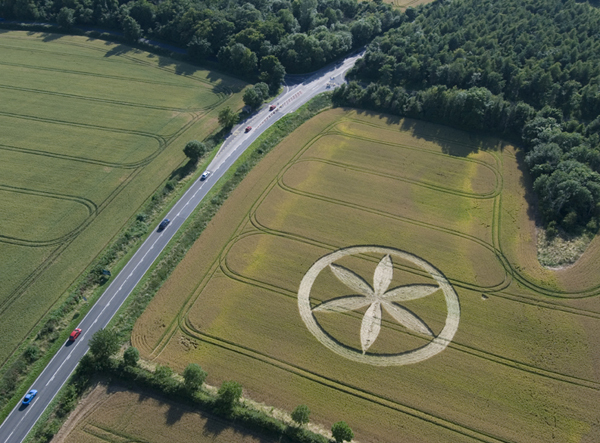 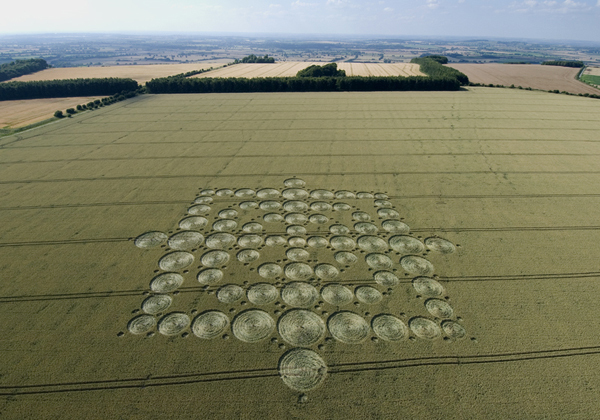 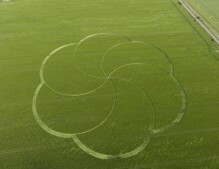 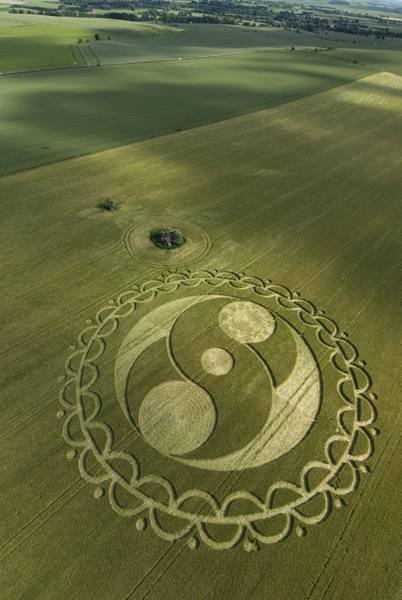 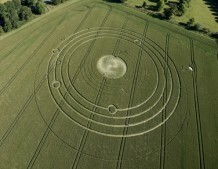 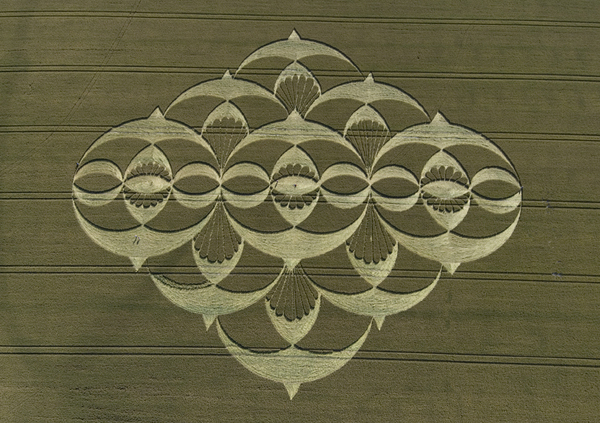 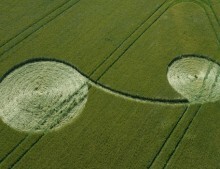 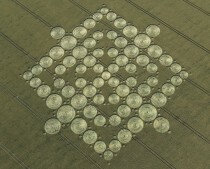 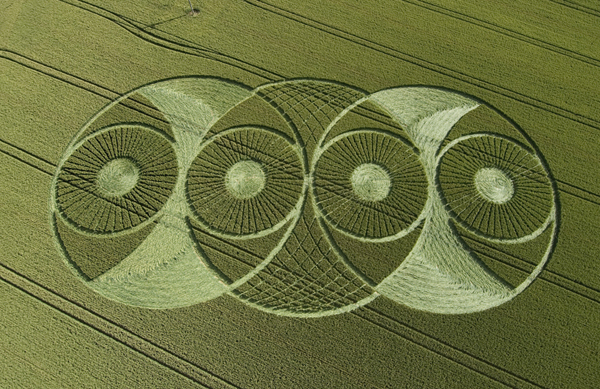 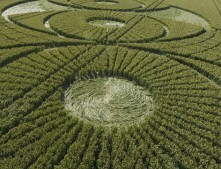 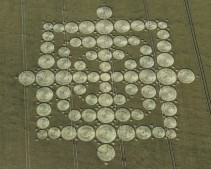 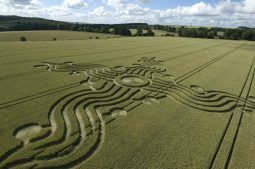 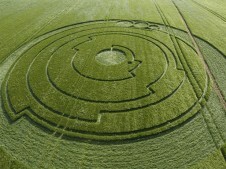 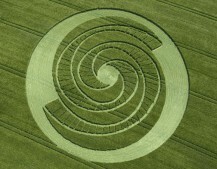 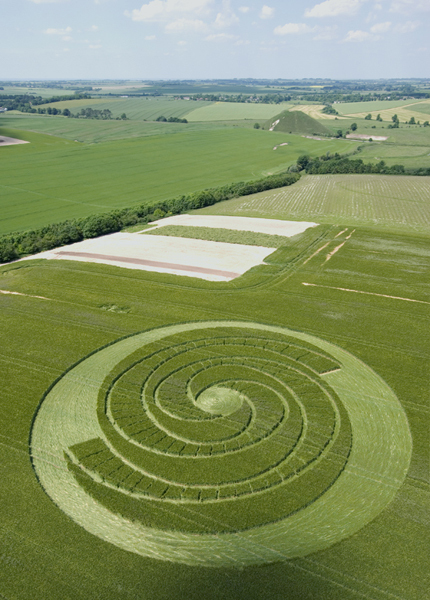 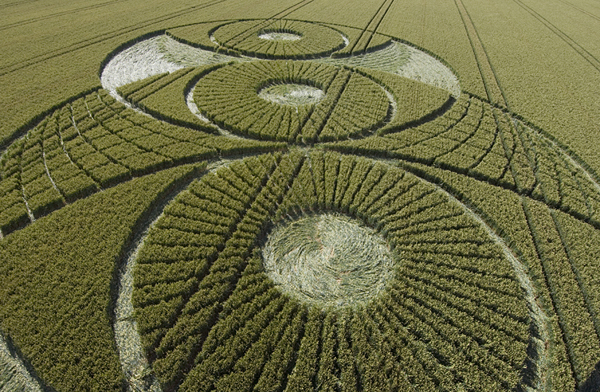 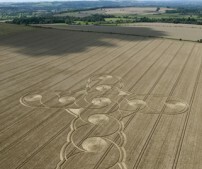 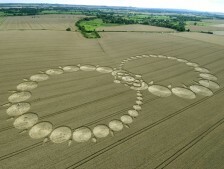 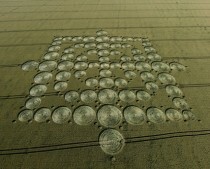 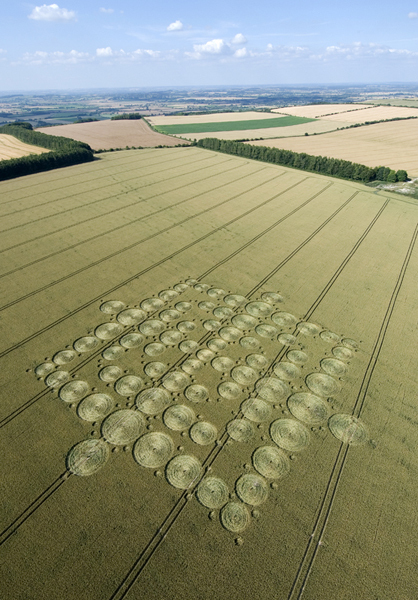 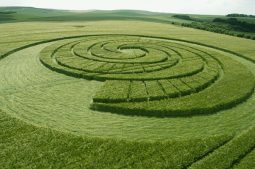 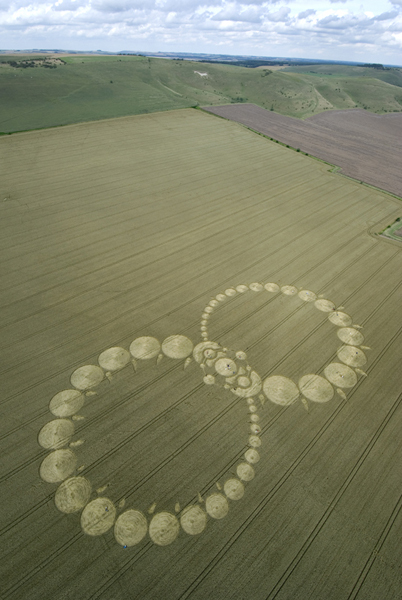 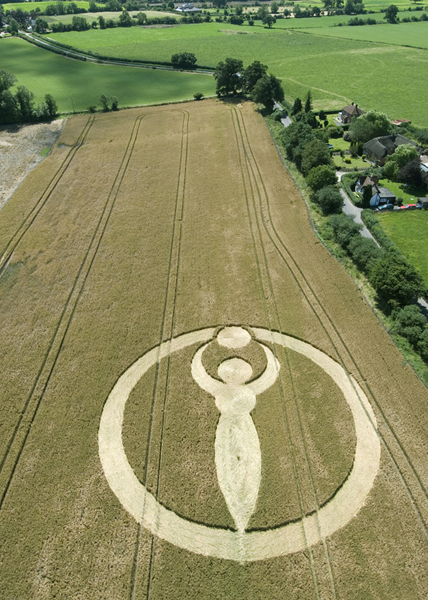 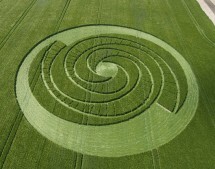 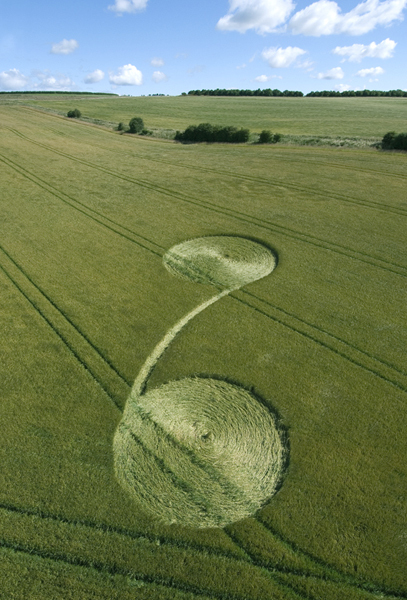 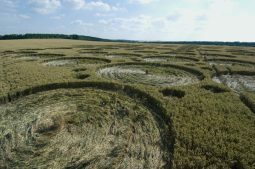 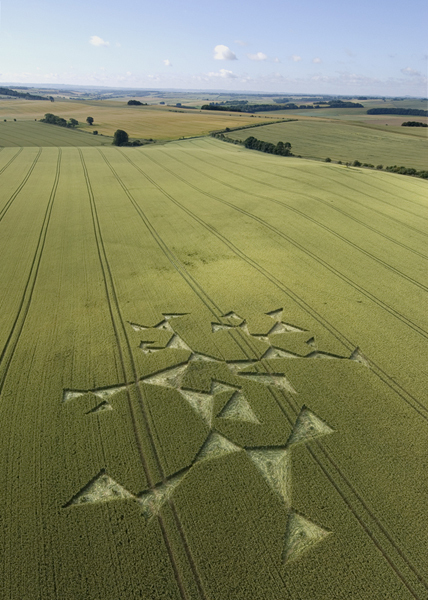 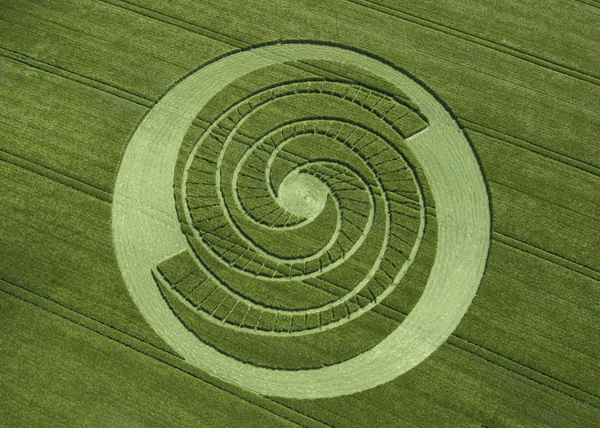 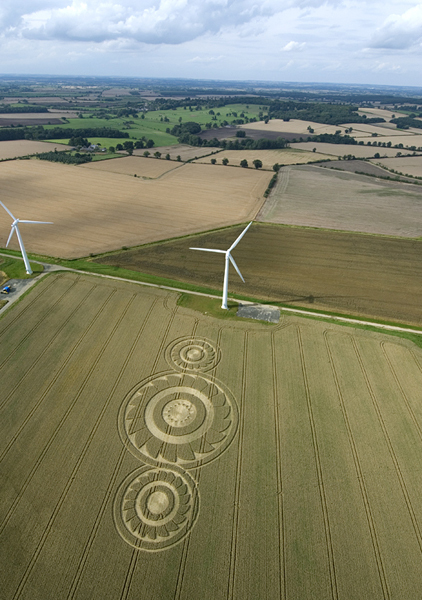 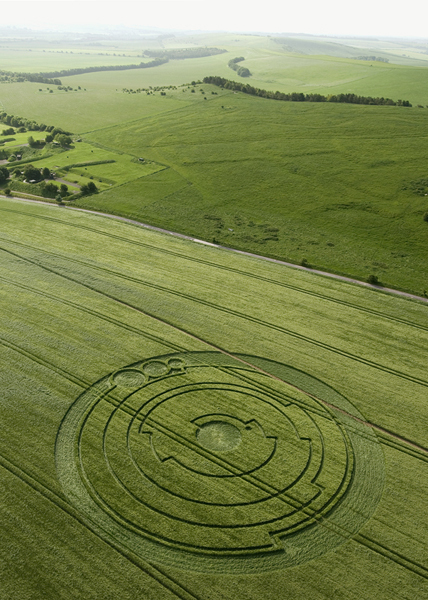 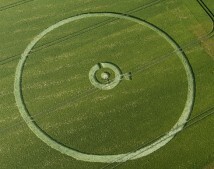 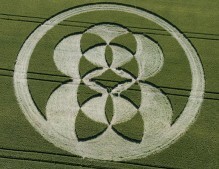 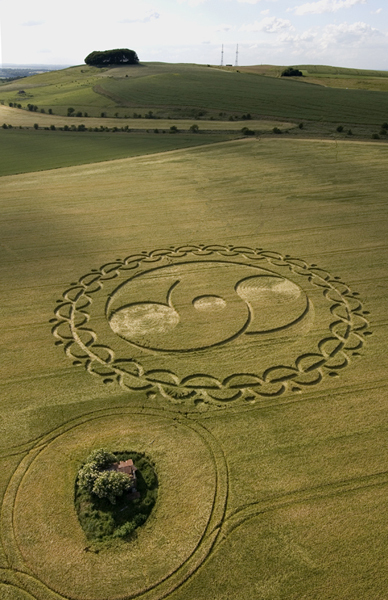 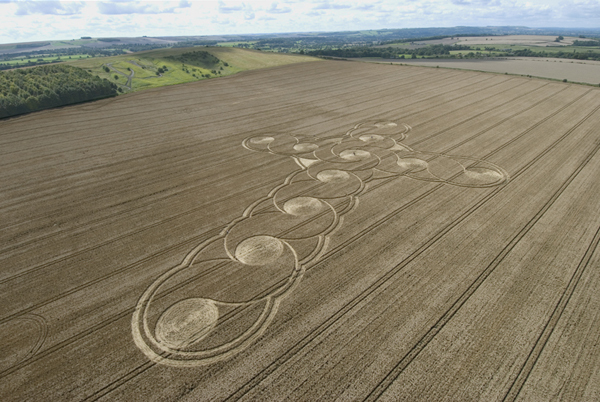 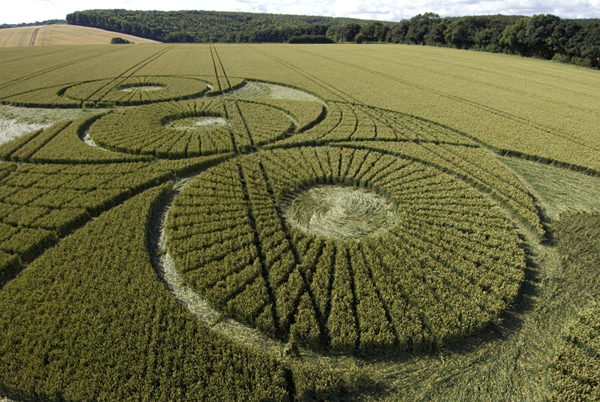 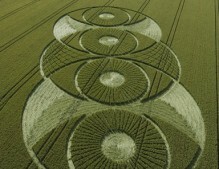 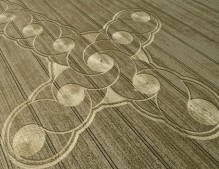 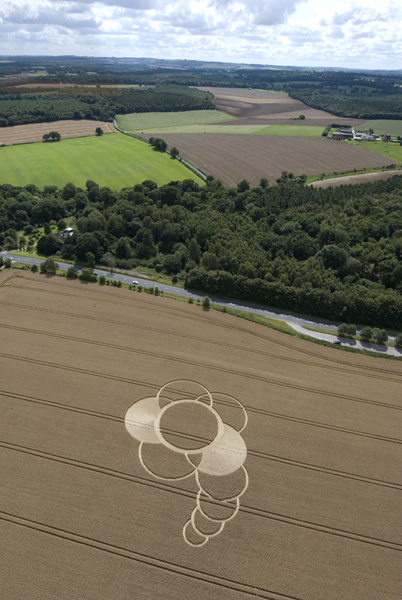 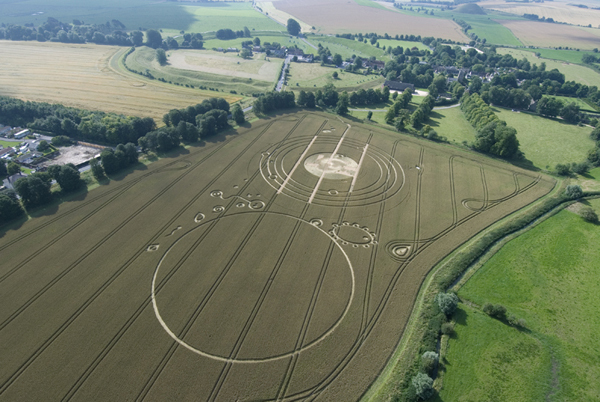 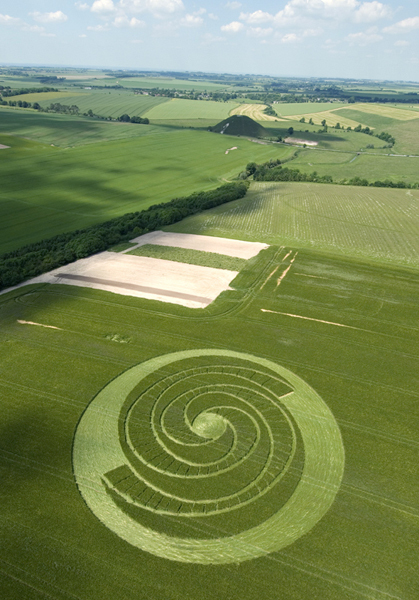 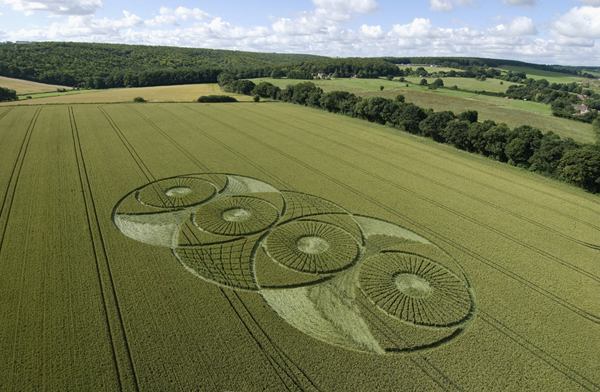 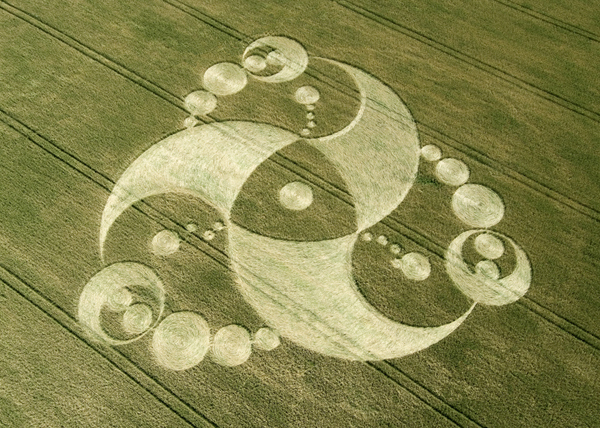 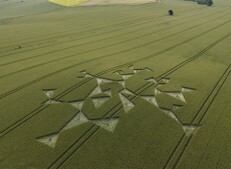 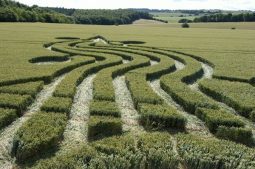 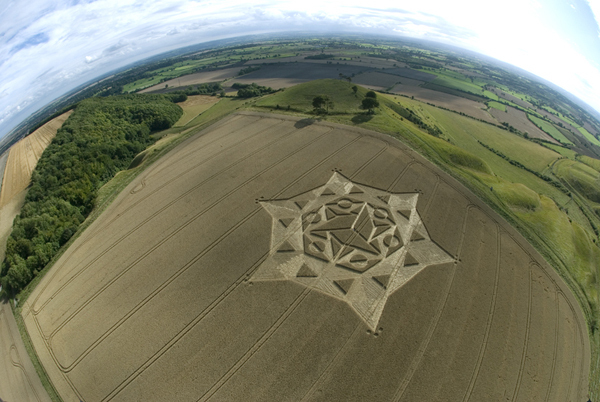 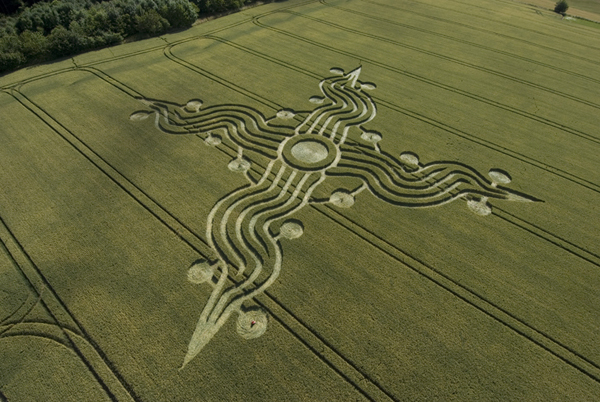 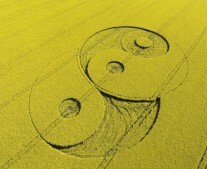 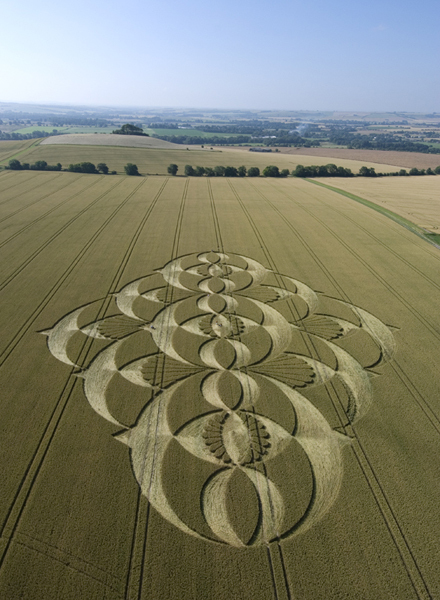 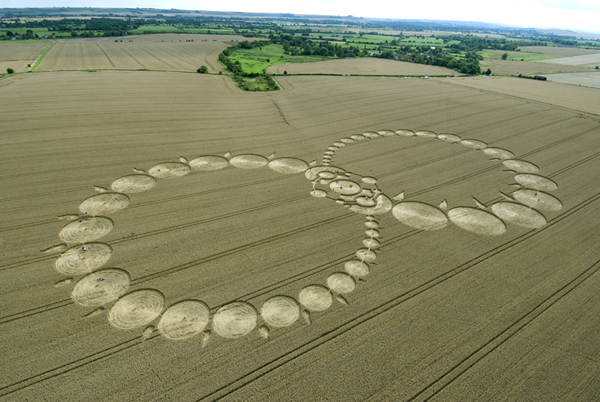 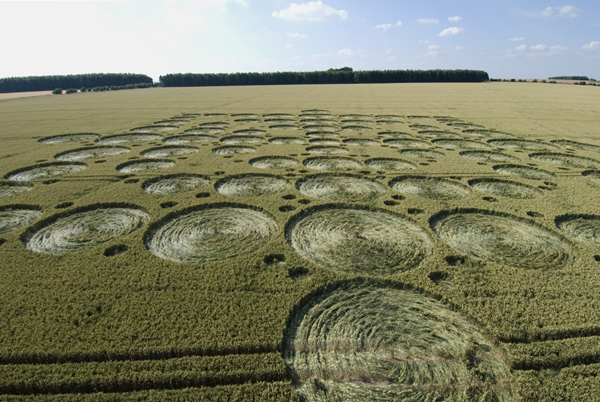 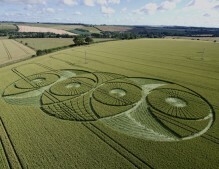 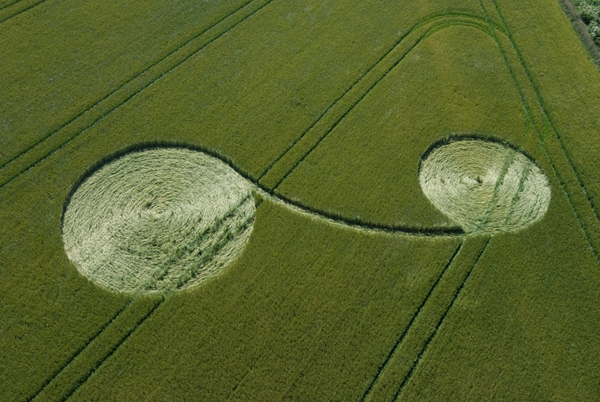 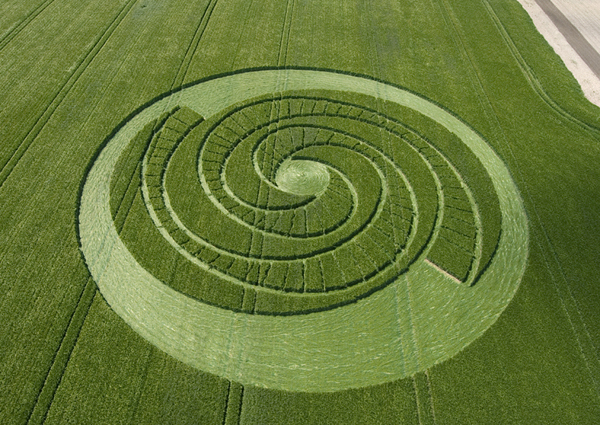 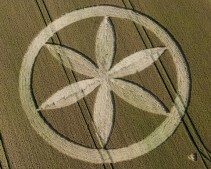 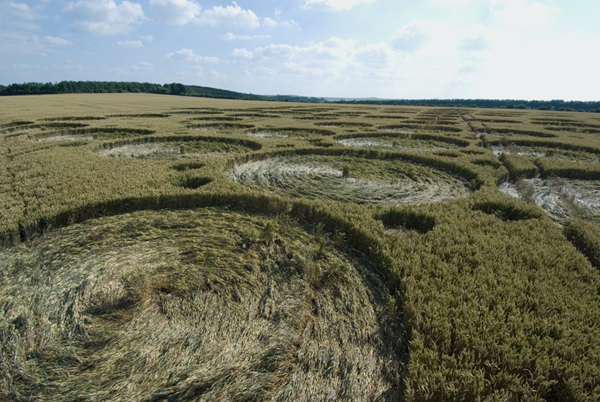 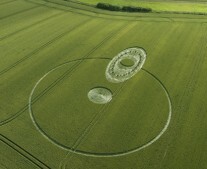 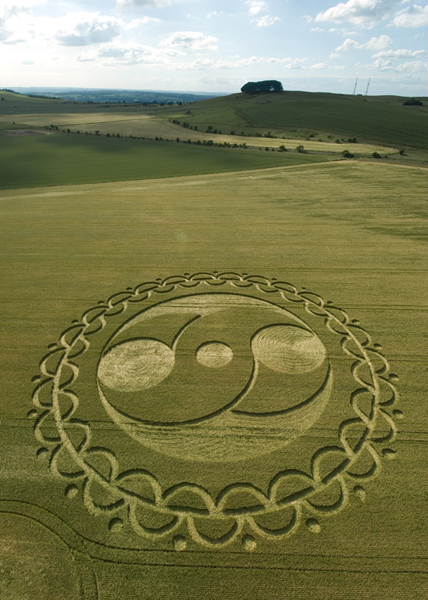 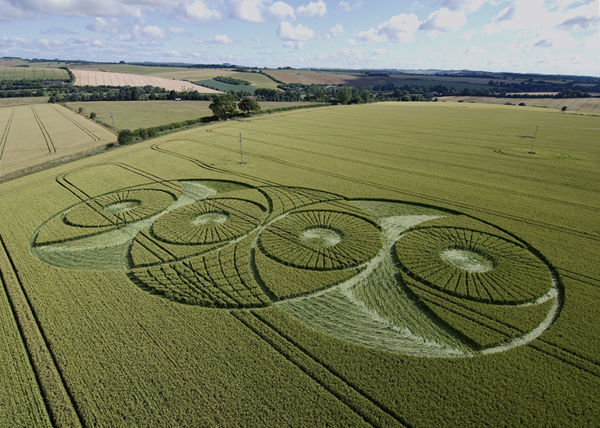 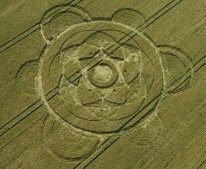 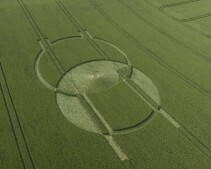 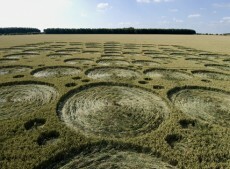 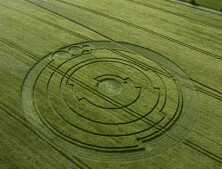 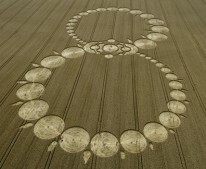 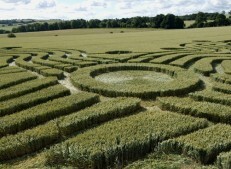 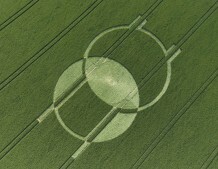 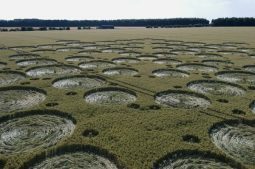 2008 was another busy year for the crop circles. 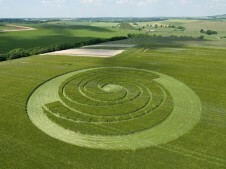 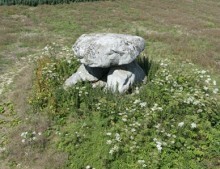 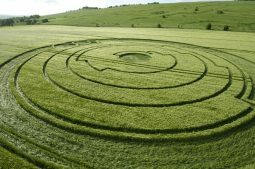 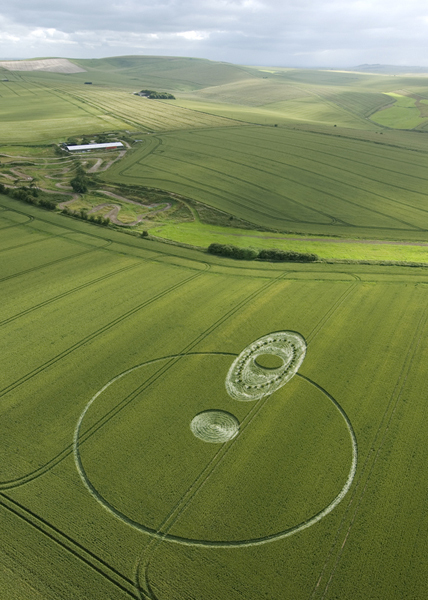 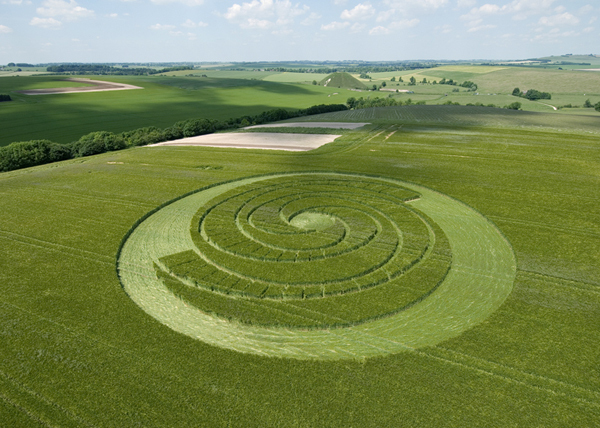 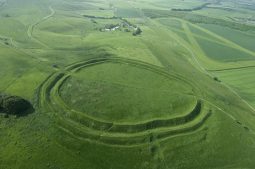 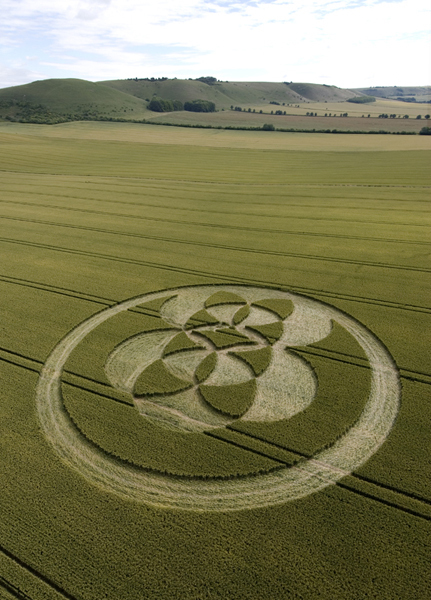 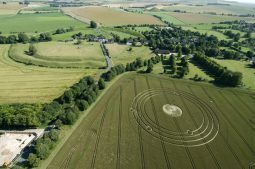 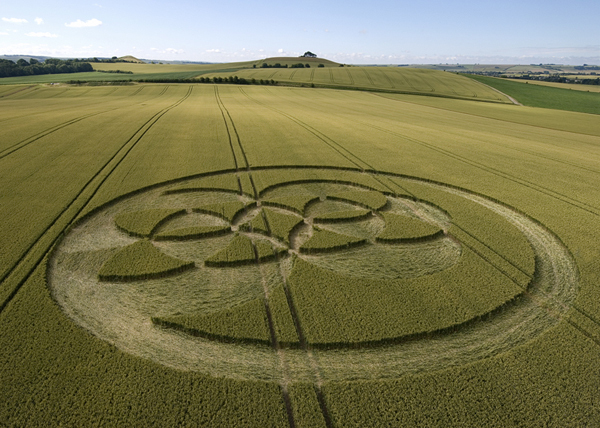 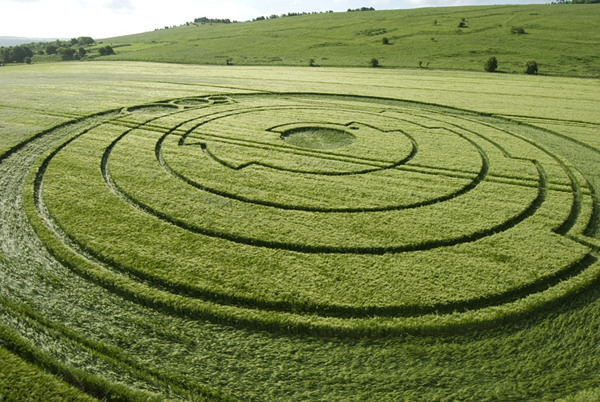 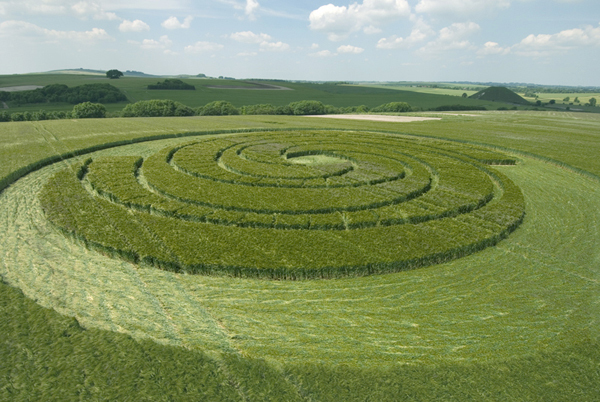 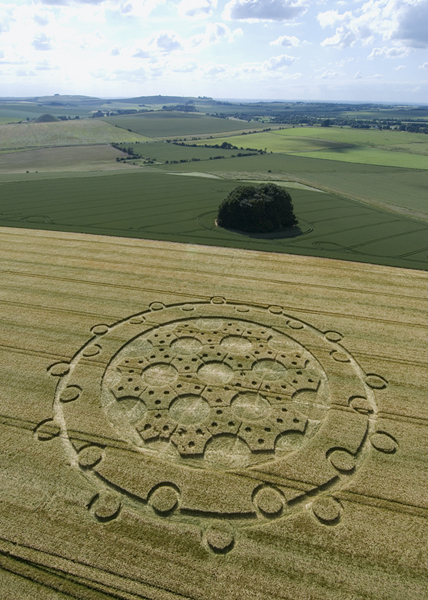 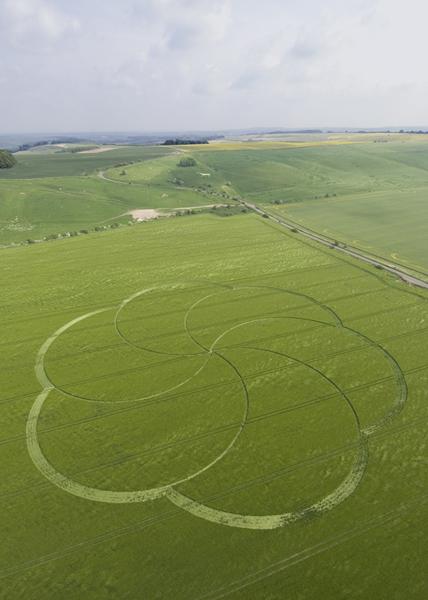 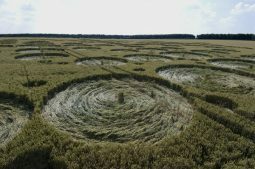 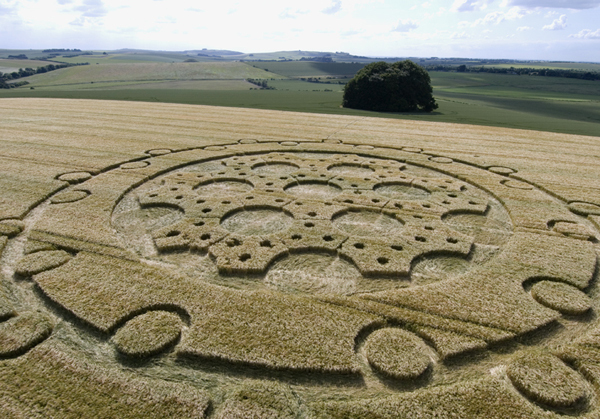 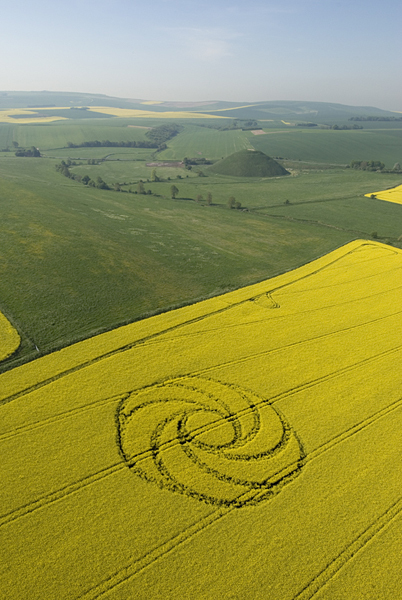 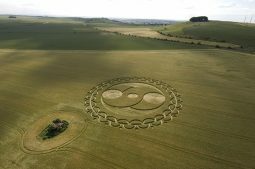 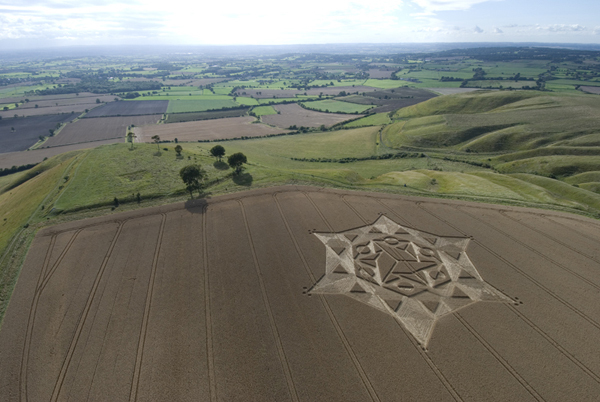 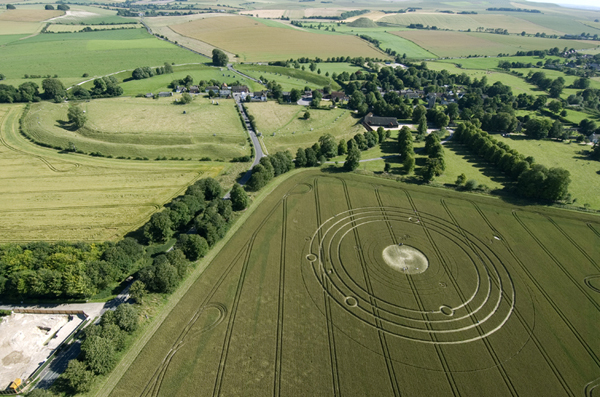 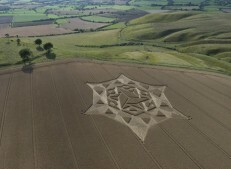 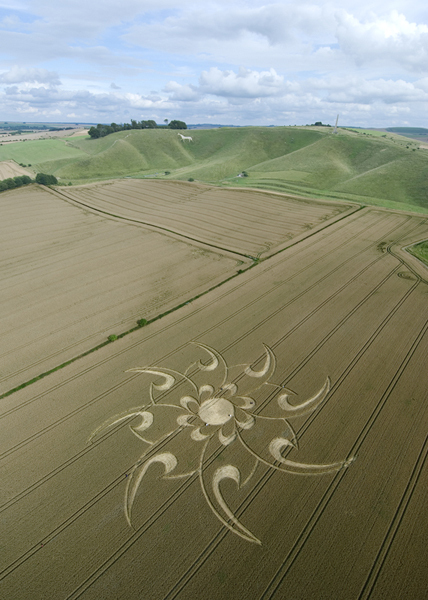 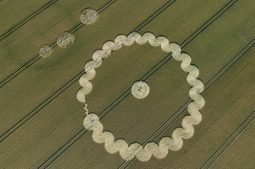 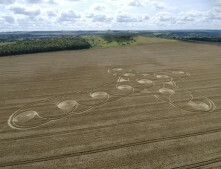 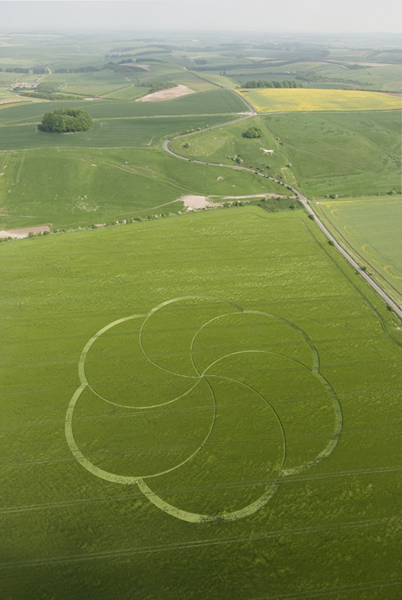 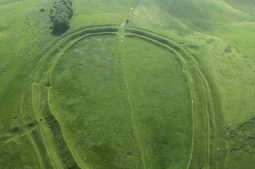 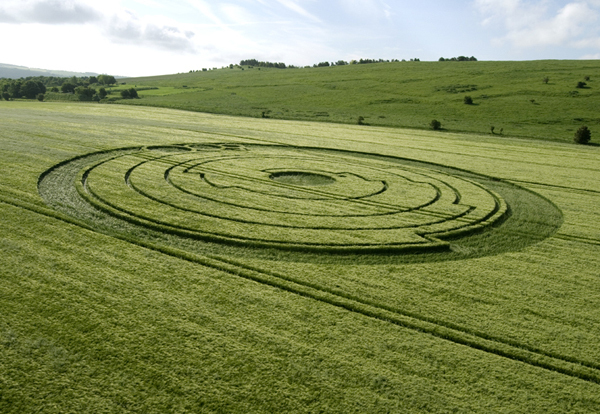 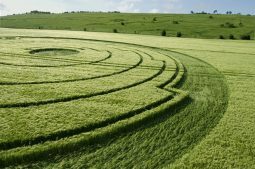 Fine circles appeared at West Kennet, The Ridgeway and Furze Knoll, but the first of the really iconic circles of 2008 appeared on the 1st of June, at Barbury castle in a field of young green barley. 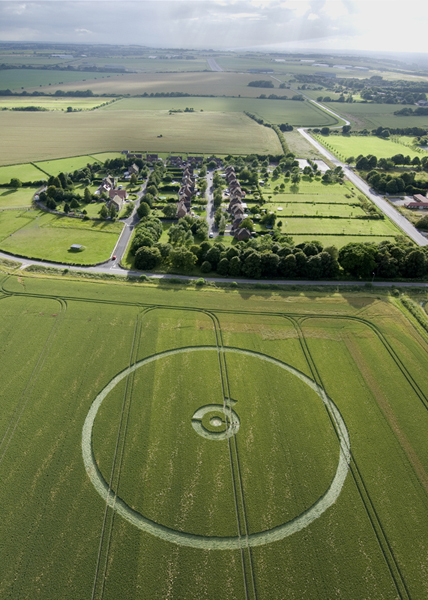 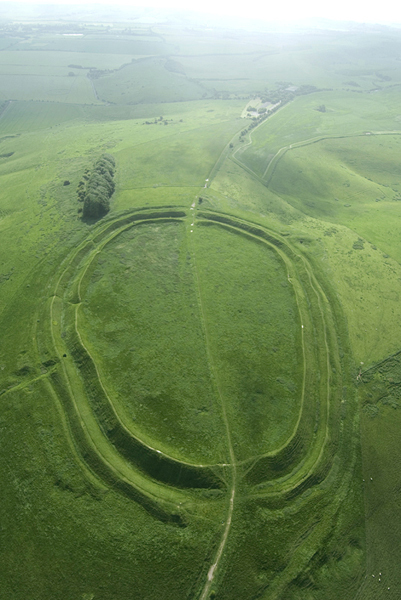 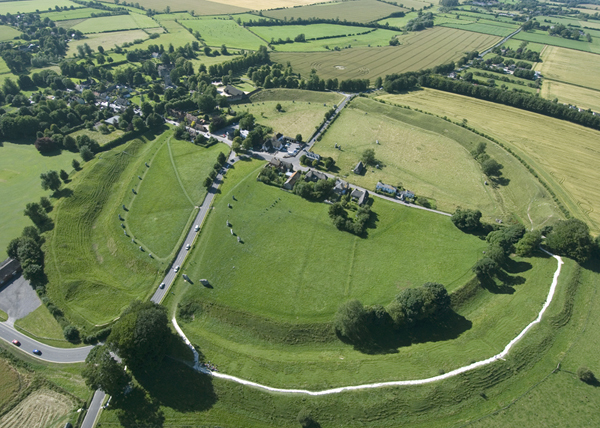 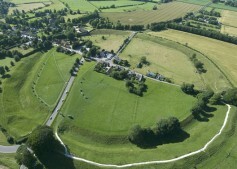 This 200ft circle contained a ratcheted spiral with three circles of diminishing size towards its outer perimeter. 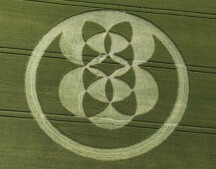 The circle was quickly interpreted as encoding the irrational number ‘Pi” 3.141592654. 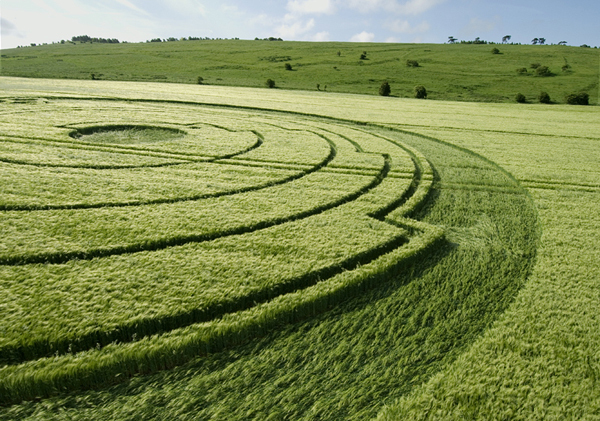 Pi is the number we use to approximate the perimeter or area of a circle. 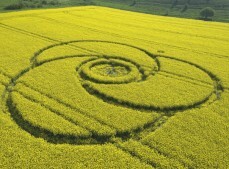 It is an irrational number (with a never ending tail of decimal places. 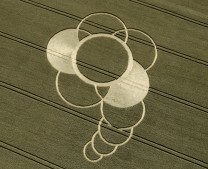 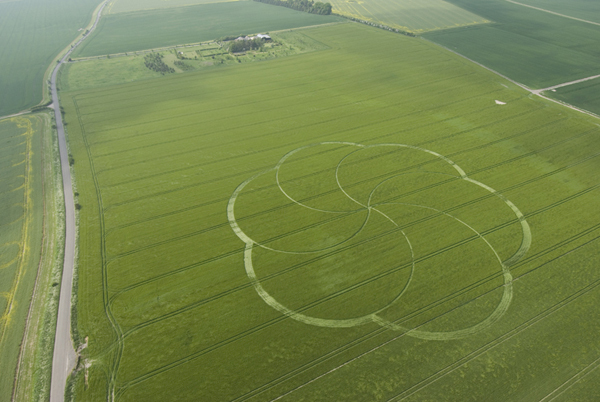 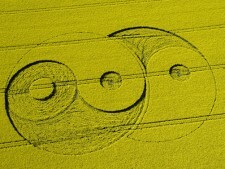 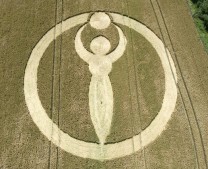 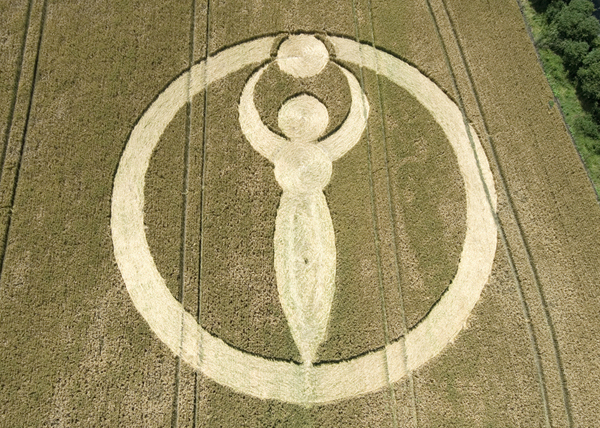 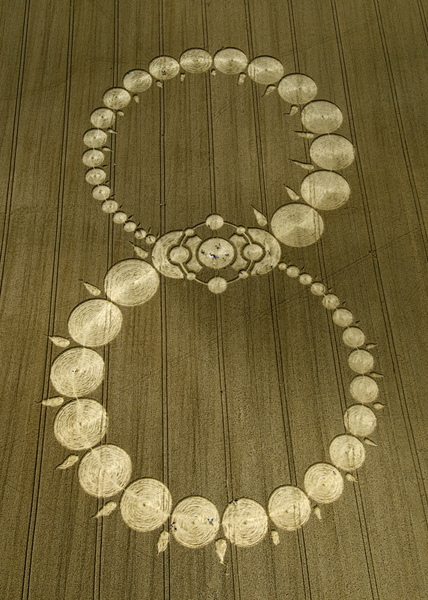 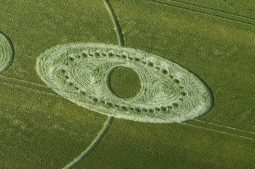 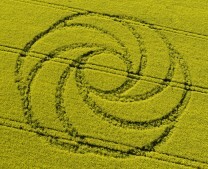 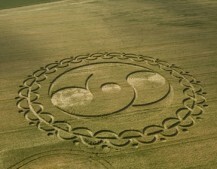 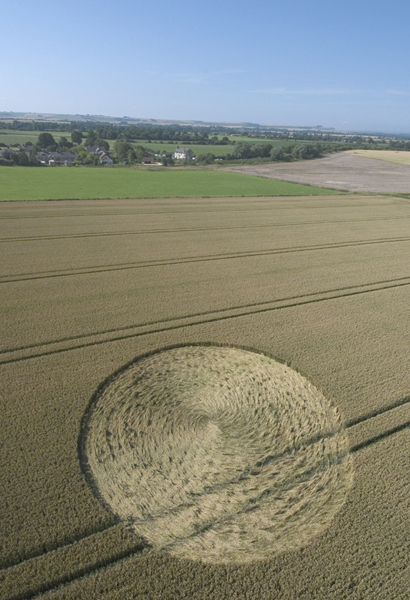 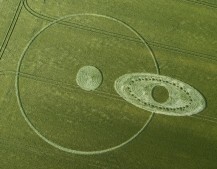 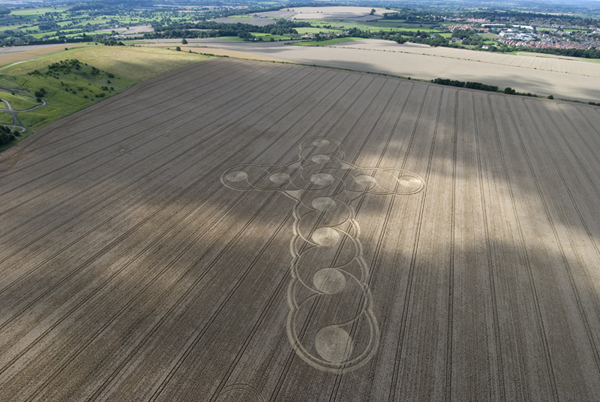 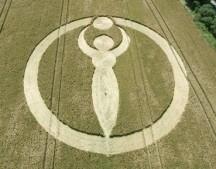 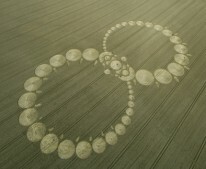 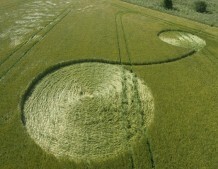 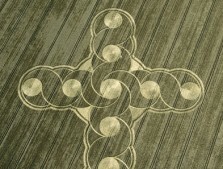 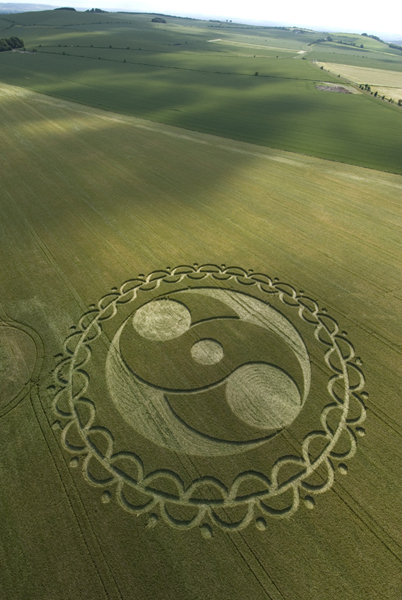 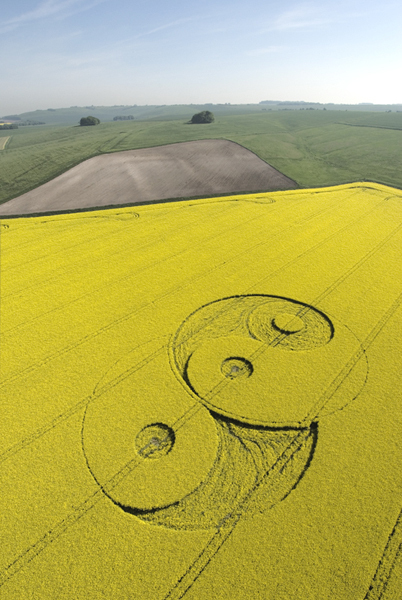 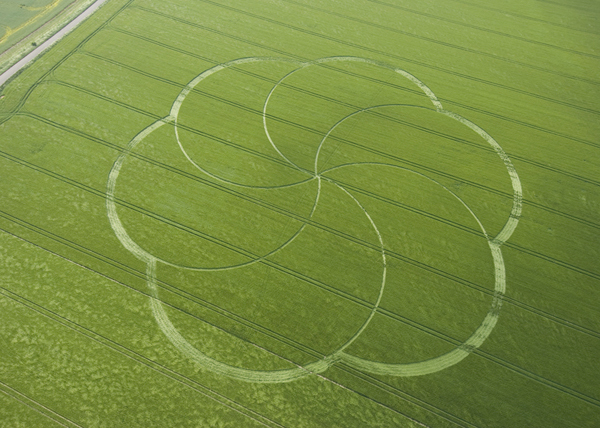 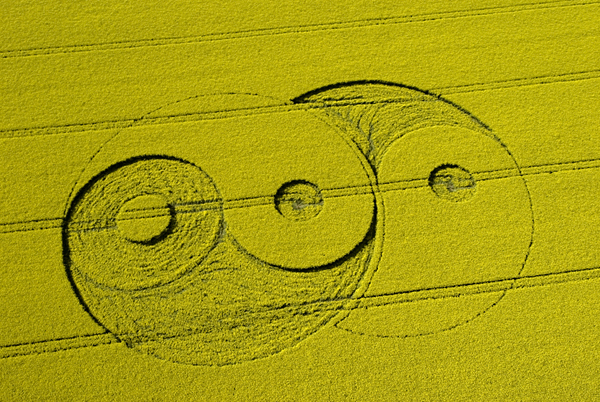 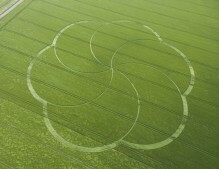 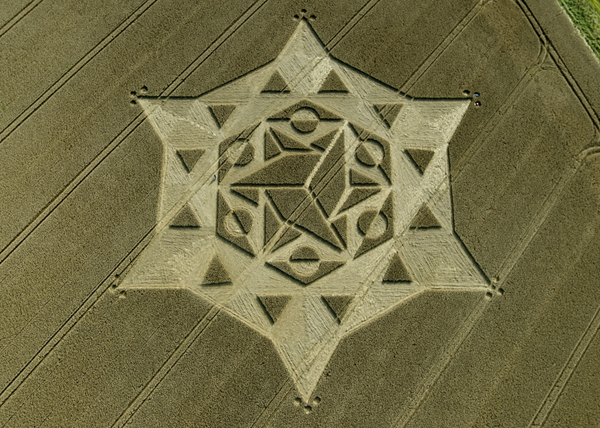 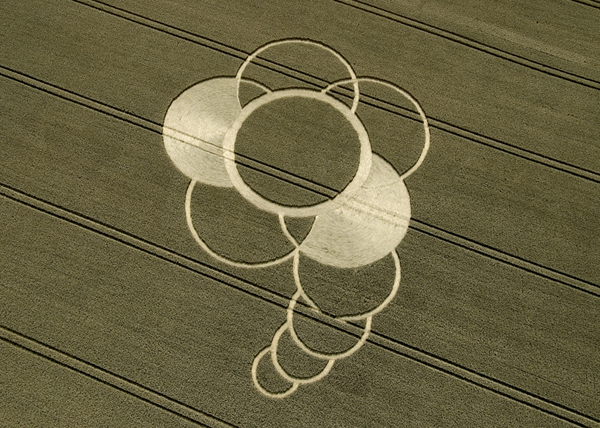 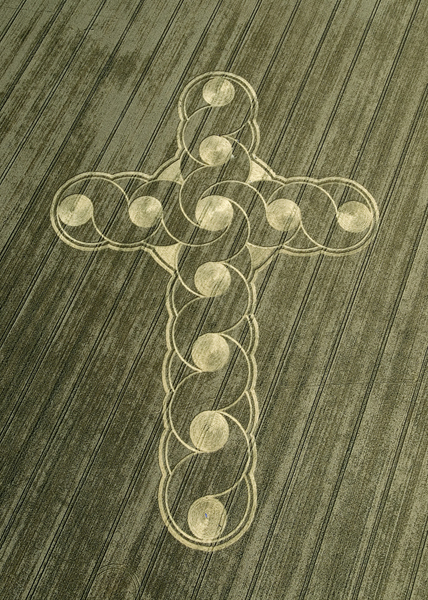 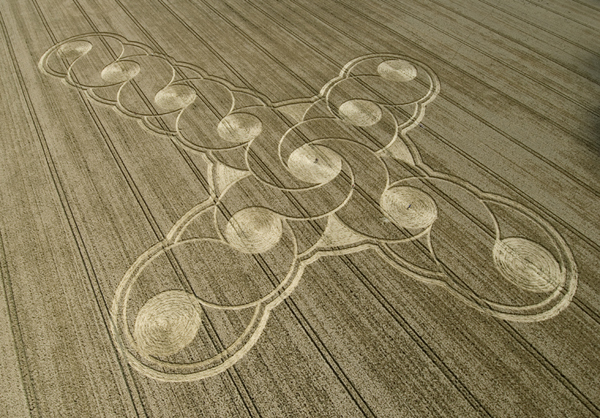 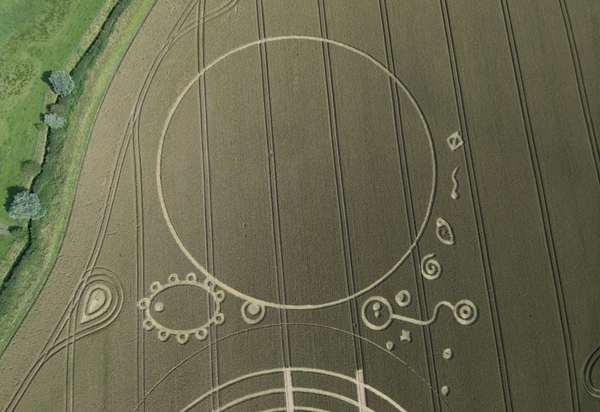 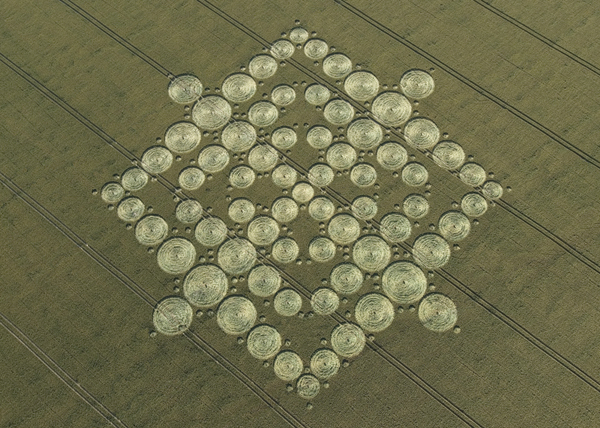 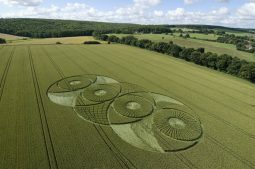 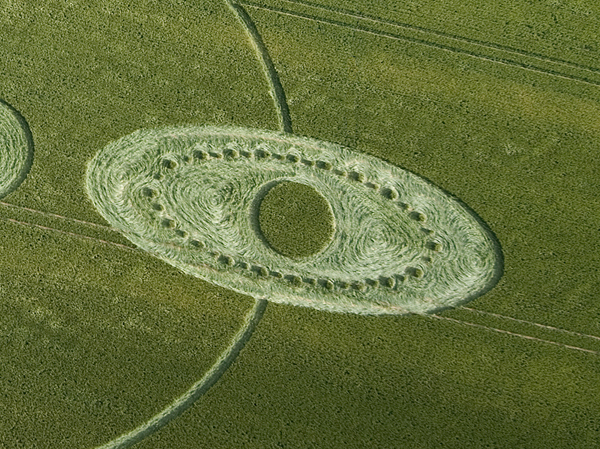 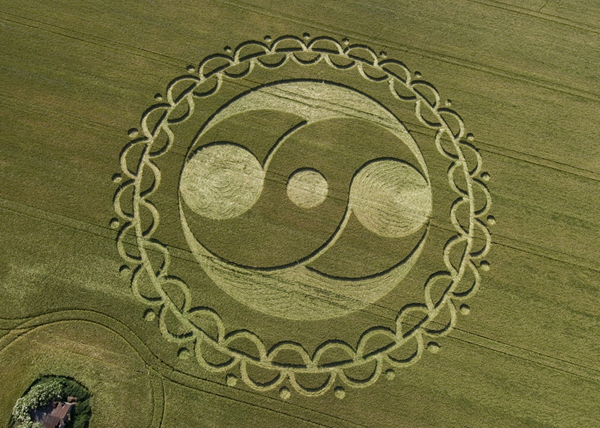 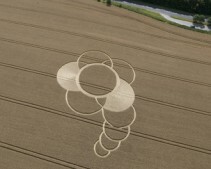 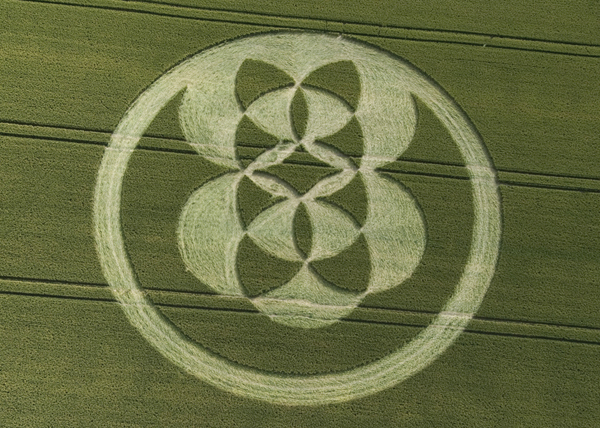 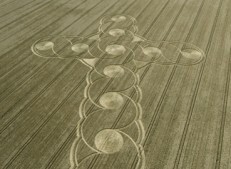 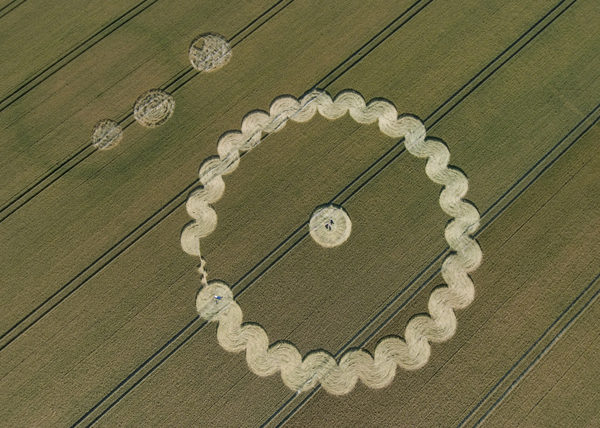 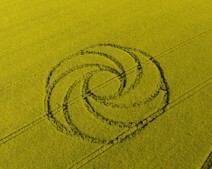 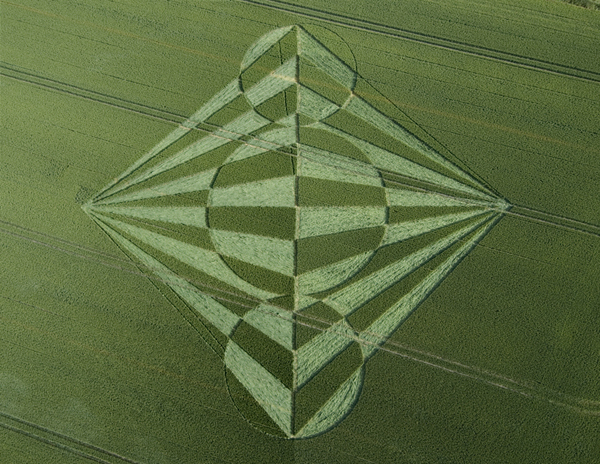 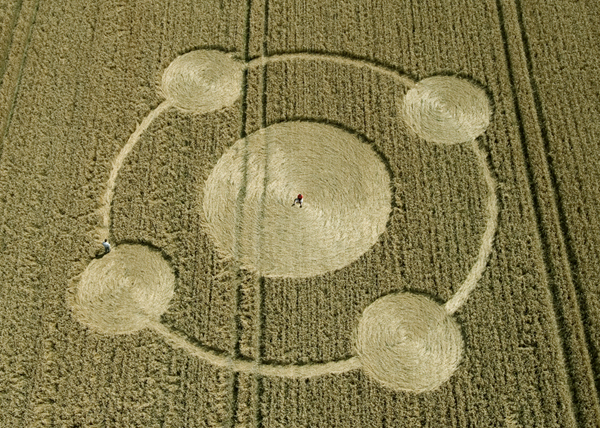 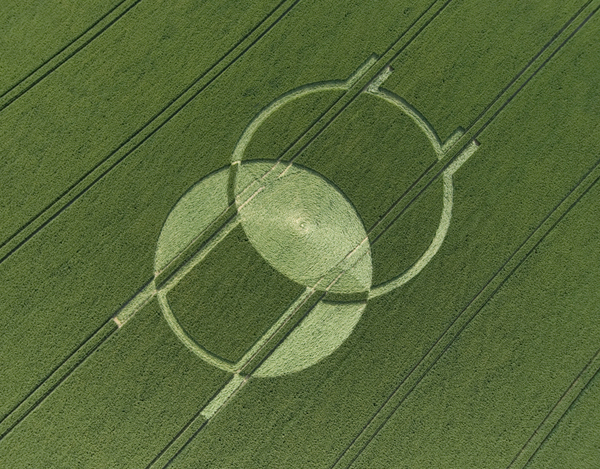 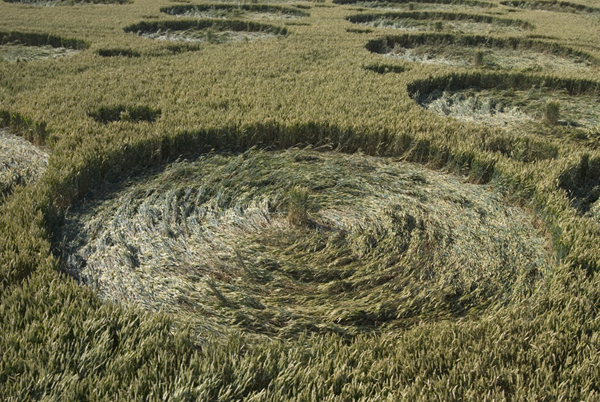 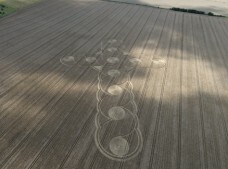 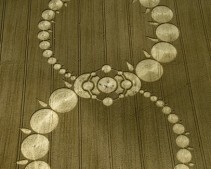 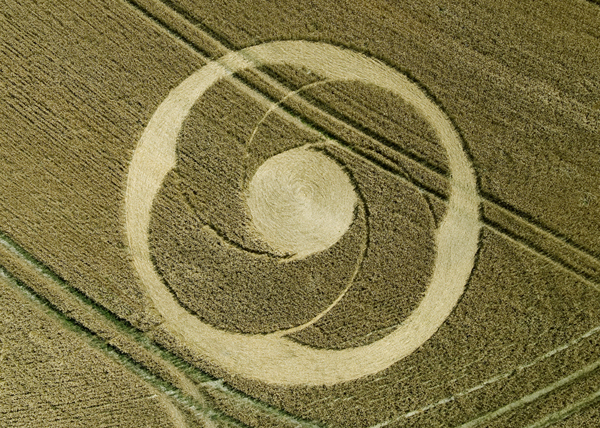 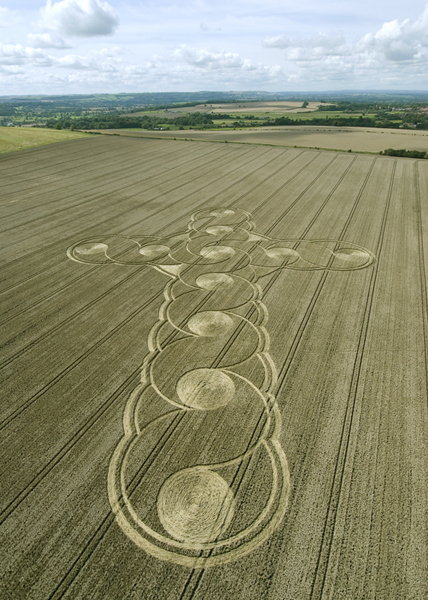 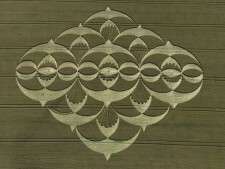 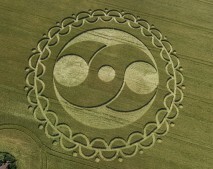 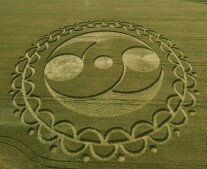 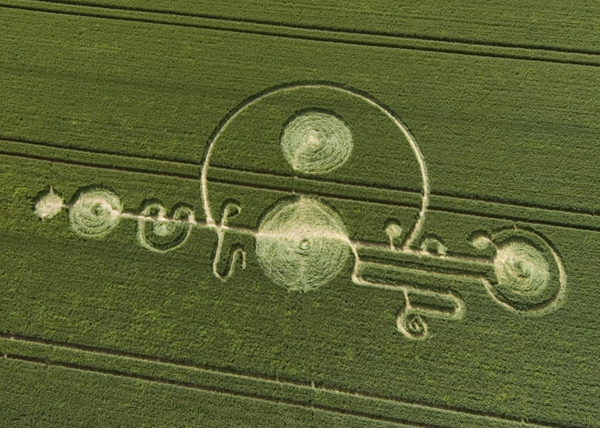 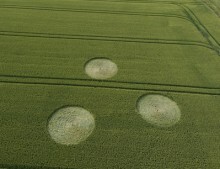 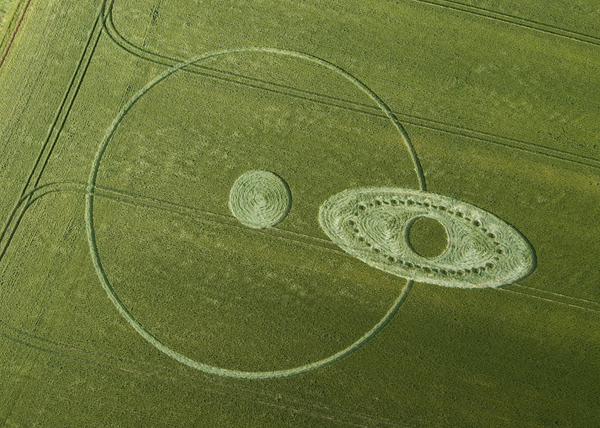 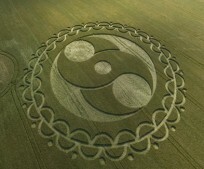 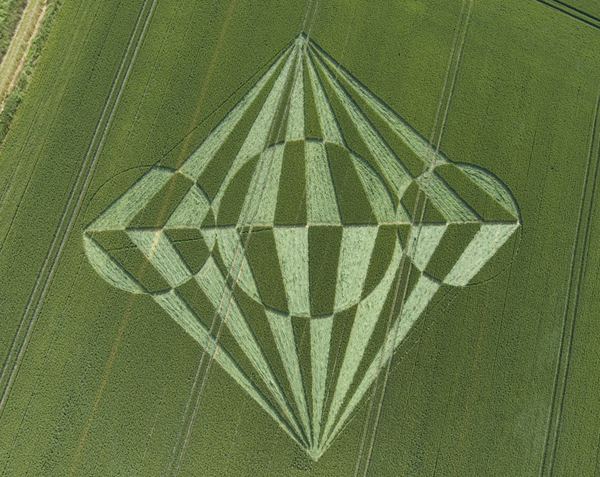 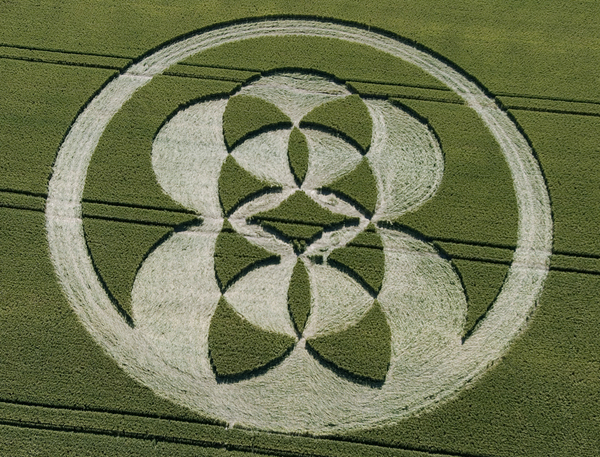 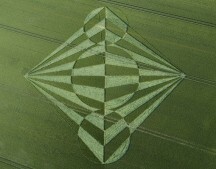 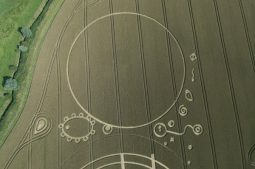 The three circles towards the perimeter of the crop circle indicating this (an ellipsis). 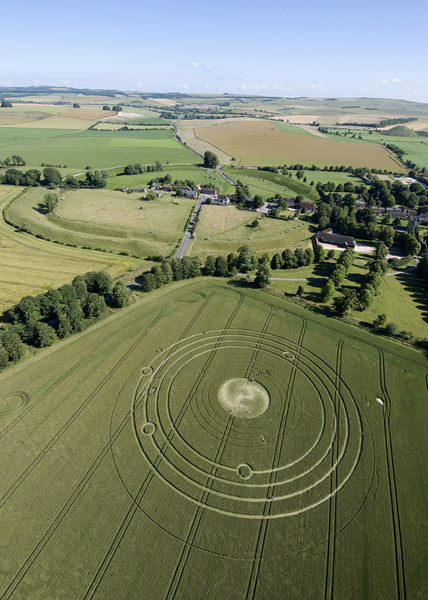 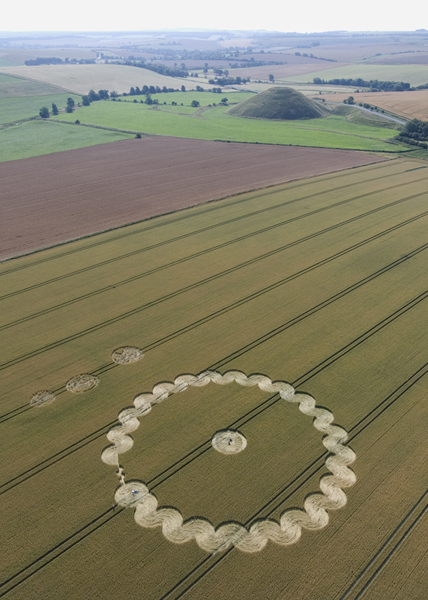 Other formations of note included: the huge circle at Avebury showed the solar system as it would appear on December 21st 2102, the ‘Wavy Cross’ at West Woods, the extraordinary bubbles at Wayland’s Smithy, the South Field Birds and the staggering ‘Eight’ which appeared on the eighth day of the eight month 2008! 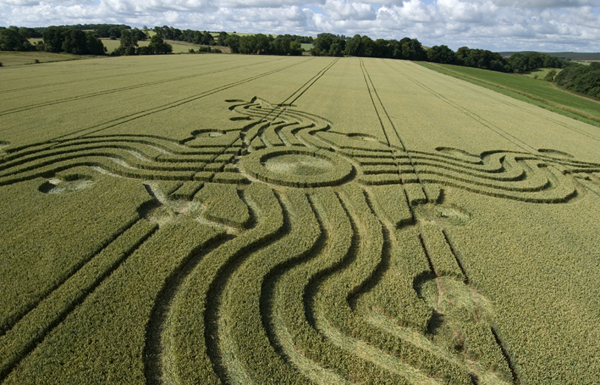 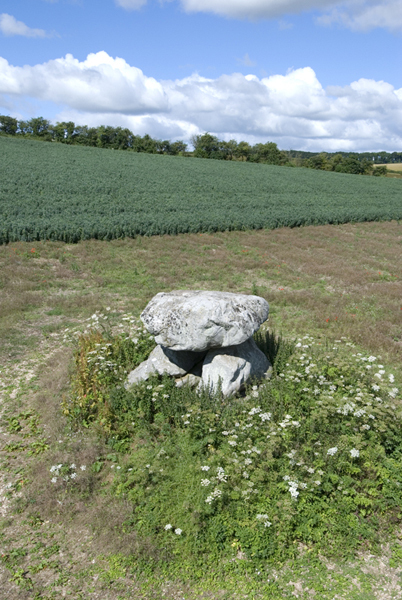 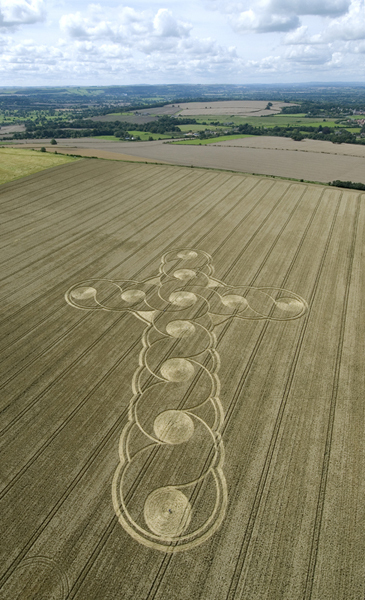 The year culminated with a huge Celtic Crucifix at Etchilhampton – a masterpiece of circle-making art.